The New York Diamond League event played host to an incredible High Jump competition, which saw both Bohdan Bondarenko and Mutaz Essa Barshim clear 2.42m before going on to attempt a new world record height of 2.46m without success. Bondarenko took victory on countback, having just one failure on his card all the way up to and including 2.42m. Robert Harting set a meeting record of 68.24m to win the Discus, while fellow German Linda Stahl threw a world-leading 67.32m in the Javelin. The men's Long Jump saw Jeff Henderson establish another meeting record (8.33m) in the fourth round and a clearance of 4.80m (WL) gave Fabiana Murer maximum points in the Pole Vault. A 48.03 clocking from Javier Culson in the 400m Hurdles smashed the world-leading best for the event and LaShawn Merritt set a meeting record of 44.19 over 400m although Wayde van Niekerk (RSA) ran a new national record (44.38) back in second place. It was business as usual for Valerie Adams as she won yet another Shot Put contest thanks to a best of 19.68m. Queen Harrison (12.62) headed a US 1-2-3 in the 100m Hurdles. There was a thrilling men's 200m in which Warren Weir stormed to a world-leading 19.82 (-0.2m/s) and compatriot Nickel Ashmeade also went sub-20 with 19.95. David Rudisha took the 800m in 1:44.63 and Tori Bowie continued her excellent season, being too strong for her rivals in the 100m (11.07). The Diamond League moves back to Europe for the 7th event of the 2014 season, which will take place in Lausanne, Switzerland. Pascal Martinot-Lagarde powered to a 13.12 clocking over the 110m Hurdles to set a world-leading time and break his lifetime best performance at the Diamond League meeting in Oslo, Norway. The men's 5000m saw Yenew Alamirew (13:01.57, WL) take victory, while Jarius Kipchoge-Birech won the 3000m Steeplechase in 8:02.27 for another world best time for 2014. The final world-leading performance came in the women's Long Jump, where Tianna Bartoletta leapt 7.02m in the second round for a comprehensive win. Will Claye bounded out to 17.41m in the Triple Jump and Renaud Lavillenie was slightly below par but still prevailed, winning the Pole Vault with his best of 5.77m. A high-quality Shot Put saw three men go over 21m, although it was Joe Kovavs who came out on top (21.14m) as David Storl and Reese Hoffa settled for the minor places. Blanka Vlasic was defeated in the High Jump on countback (1.98m) as Mariya Kuchina equalled her PB to win the competition. Local hero Andreas Thorkildsen was way behind in the Javelin (72.70m), finishing last of the 11 throwers. Tero Pitkamaki claimed victory (84.18m) by the narrowest of margins with Julius Yego's last round effort of 84.17m falling short by just 1cm. There was almost the season's first sub-50 400m as Novlene Williams-Mills strode to a comfortable 50.06. Allyson Felix triumphed in the 200m with her time of 22.73 good enough to beat a blanket finish for second place with 0.02sec splitting the next four women. The illustrious Dream Mile was won by Ayanieh Souleiman (3:49.49). New York is the venue for the next Diamond League meeting this coming weekend. 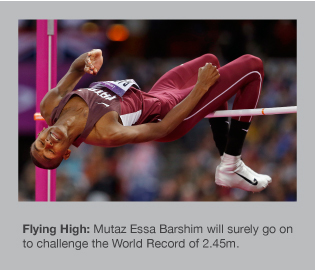 Mutaz Essa Barshim soared over 2.41m in Rome to set a new area record and equal the Diamond League record with a fabulous display of high jumping in the Italian capital. 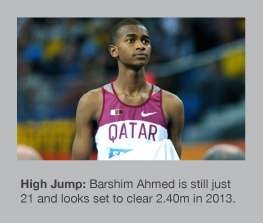 With only one failure on his card (at 2.28m), the prodigious young talent from Qatar went on to clear every height up to 2.41m at the first attempt before narrowly failing at 2.43m. There was nearly late drama as Bohdan Bondarenko also attempted 2.43m and came equally close to being successful but had to be content with 2nd place and a best of 2.34m. Elsewhere in the field, Robert Harting nearly broke the Discus meeting record with his best effort of 68.36m to take victory by exactly two and a half metres from Piotr Malachowski, while Yarisley Silva set a world-leading 4.70m in the Pole Vault and Valerie Adams again went beyond 20m in the Shot Put - this time with 20.01m. Barbora Spotakova was a convincing winner of the Javelin (66.43m) with all five of her valid throws further than the best any of her rivals could manage. On the track, Kaliese Spencer improved her own world's best time for 2014 in the 400m Hurdles with a 53.97 clocking. Silas Kiplagat showed real class to charge clear in the final stages of the 1500m to win in 3:30.44. Asbel Kiprop was back in 3rd (3:31.89). It was Ethiopian glory in the women's 5000m as Genzebe Dibaba proved too strong for a high quality field with her 14:34.99 WL. LaShawn Merritt cruised to 44.48 to take maximum points in the 400m and compatriot Brianna Rollins lead a US 1-2-3 in the 100m Hurdles, lowering the world-leading time of 12.53 in the process. Another US athlete, Tori Bowie, shone in the women's 100m setting a PB of 11.05 on her way to defeating Kerron Stewart (11.08). 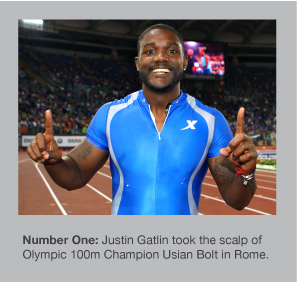 Justin Gatlin secured another 100m victory this season with 9.91. Having run an African record of 8:20.68 in the 3000m in Doha on 9 May, Kenya’s Hellen Obiri stormed to a 3:57.05 clocking over 1500m at the third Diamond League event of the 2014 season in Eugene, USA. The time was a US all-comers’ record, taking more than 1.5secs off her previous mark set at the same meeting last year. There was an unforgettable finale to the men’s 400m, which saw the two favourites - Kirani James and LaShawn Merritt, run the home straight practically stride-for-stride as they crossed the line together, both in 43.97. James was given the verdict in a photo finish. It was only the sixth time outdoors that two men have gone under 44 seconds in the same race. Will Claye bounded out to 17.66m to secure victory in the Triple Jump followed by Christian Taylor’s windy 17.42m effort. There was a world-leading time of 9:11.39 in the women’s 3000m steeplechase for Sofia Assefa, while Justin Gatlin was once again hugely impressive in winning the 100m - on this occasion he was aided by a wind-assisted +2.7m/s in sprinting to 9.76 ahead of Mike Rodgers (9.80). Jimmy Vicaut was third in 9.89. Another dominant display from Sandra Perkovic saw a meeting record in the Discus of 69.32m to win by a margin of almost 4m. In an incredibly tight Long Jump contest, Ivana Spanovic went out to a national record of 6.88m to win on countback from Darya Klishina, who managed the same distance. Eloyse Lesueur was 1cm back in third and Brittney Reese a further 1cm behind in fourth with her first jump of 6.86m. It was a USA 1-2-3-4 in the Shot Put as Reese Hoffa managed a season’s best of 21.64m and Galen Rupp was another home winner in the 10,000m with a new American record of 26:44.36 (WL) to defeat a host of top Africans. The first four all ran under 27 minutes. There was a world-leading leap of 2.01m for Anna Chicherova in the High Jump and Kaliese Spencer was comfortable over the 400m Hurdles, finishing nearly a second clear of Kori Carter. Pascal Martinot-Lagarde secured maximum points in the 110m Hurdles thanks to a 13.13 (WL) run, and Tori Bowie won a star-studded 200m in yet another world-leading performance (22.18). The men’s 800m saw Nijel Amos defeat the great David Rudisha as the Kenyan could only trail in 7th. Another middle-distance legend, Asbel Kiprop, also finished 7th - this time in the prestigious Bowerman Mile, which Ayanleh Souleiman took in 3:47.32 for a Diamond League record. The Diamond League moves to Europe for the first time in 2014 for the Golden Gala in Rome on Thursday 5 June. The 2nd Diamond League meeting of the 2014 season provided a mixture of shocks and world-leading performances in Shanghai. It was Egyptian Abd Ihad El Rahman who arguably produced the performance of the day with his enormous 89.21m Javelin throw in the first round, which added over 5m to his lifetime best and also won the competition by a similar margin. It was a world-leading throw, an area record and a meeting record. Blessing Okagbare enjoyed a 200m / Long Jump double with her 22.36 victory following up an earlier 6.86m leap - both meeting records. There was a world-leading 70.52m throw from Sandra Perkovic as the Discus number one stamped her authority on the discipline. She had another couple of efforts just below the 70m mark. It was business as usual for Pole Vault star Renaud Lavillenie, who won the event by 30cm with his best of 5.92m (WL), which was achieved at the first attempt. 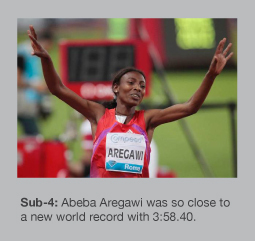 Abeba Aregawi dipped under the 4-minute barrier over 1500m thanks to her 3:58.72 world-leading run. The men's 100m saw Justin Gatlin lay down a strong early-season marker with a world-leading 9.92 to put daylight between himself and a strong field. Nesta Carter was 2m back (10.12) in 2nd place. Neither Allyson Felix nor Amantle Montsho could win the 400m as Novlene Williams-MIlls judged her race to perfection and triumphed in 50.31. The strangest 'contest' of the meting was surely the women's 3000m Steeplechase as Emma Coburn took an early lead and simply ran away from her rivals, who let her gain an advantage of 50-60m. Despite their best efforts to claw back the deficit, Coburn held on magnificently to clock 9:19.80 (WL) and take maximum Diamond League points. Taoufik Makhloufi celebrated prematurely in the closing stages and let Robert Biwott sneak up on the outside to win the 800m in 1:44.69 - a massive new PB for the young Kenyan runner. There was no double for Kenya in the 5000m, with Yenew Alamirew storming away to a 13:04.83 meeting record to defeat Thomas Longosiwa. The home fans had the best saved for last as Chinese sprint hurdler Xie Wenjun caused a major shock by getting the better of a star-studded line-up including David Oliver, Dayron Robles and Ryan Wilson with a 13.23 PB. Eugene will host the next Diamond League event at the end of May as the season starts to gather momentum. The Diamond League season got off to a spectaular start in Doha, Qatar with a number of record-breaking performances and some thrilling races witnessed by the capacity crowd. Looking imperious as ever, Asbel Kiprop majestically timed his finish to perfection with a 3:29.18 clocking to win the 1500m and establish a meeting record. The first six men across the line ran under 3:31, emphasising excellent strength in depth. His Kenyan compatriot, Hellen Obiri, set a new African and Diamond League record in the 3000m (8:20.68) as Ethiopia's Genzebe Dibaba faded disappointingly in the final 250m. Obiri has now elevated herself to fifth place on the all-time lists for the event, and the fastest ever non-Chinese athlete. Ivan Ukhov continued his superb year with a first-time 2.41m High Jump clearance that now ranks him equal third in history. In an event where the first four men all cleared 2.37m or better (the first time this has ever happened outdoors), it was the Russian who took victory ahead of Derek Drouin, Erik Kynard (=PB) and Mutaz Essa Barshim. Lashawn Merritt equalled the world-leading time of 44.44 to win the 400m, although Pavel Maslak impressed with his national record of 44.79 back in third and the first five went sub-45 seconds. Fellow American David Oliver stormed to 13.23 (=SB) in the 110m Hurdles. Kenyan runners filled the first eight places in the 3000m Steeplechase however it was Ezekiel Kemboi was proved the strongest, surging away to record a world-leading time of 8:04.12. A Jamaican 1-2 in the 200m saw Nickel Ashmeade (20.13) get the better of Warren Weir and Mohammed Aman won an enthralling 800m in 1:44.49 as he and Nijel Amos (1:44.54) enjoyed a memorable duel in the home straight. The most predictable success of the evening came in the women's Shot Put as Valerie Adams dominated once again, this time with a best effort of 20.20m to win nearly a metre and a half. There was Kenyan delight on the streets of London as Wilson Kipsang and Edna Kiplagat took the honours in the 2014 London Marathon. Just over six months since taking a large chunk off the previous World Record in Berlin with 2:03:23, Kipsang stormed to a new course record in 2:04:27, while Kiplagat held off her compatriot Florence Kiplagat to win the women's race by just three seconds in 2:20:19. Mo Farah completed the course in 2:08:21 and could only finish back in 8th place - 68 seconds off the British record set by Steve Jones 29 years ago. Three male and female athletes have been revealed on the 2013 World Athlete of the Year shortlists, and they will go on to contest this prestigious award at the World Athletics Gala in Monaco in less than two weeks on Saturday 16 November. The Marathon World Record was smashed earlier today in the German capital of Berlin as Kenyan Wilson Kipsang clocked a time of 2:03:23 to take 15 seconds off the previous mark. Another Kenyan, Patrick Makau, had held the former record, which he also set at the Berlin Marathon back in 2011. Kipsang looked very strong throughout the race and accelerated towards the line to cap a generally positive 18 months during which he has won the London Marathon and picked up the bronze at last summer's London 2012 Olympics. Kipsang's pre-Berlin best of 2:03:42 had made him the 2nd fastest in history, however this latest performance has elevated him to one of the greatest marathon runners in recent years. On the world all-time lists, the top 34 are all either from Kenya or Ethiopia, with Kenyans filling 8 of the top 10 places. Mohammed Aman lit up the final Diamond League meeting of 2013 in the Belgian capital of Brussels with a superb victory over 800m in a scorching 1:42.37 that was a new Ethiopian record, making him the 9th fastest in history over the distance. Usain Boltin won the 100m with 9.80 to delight the 50,000 capacity crowd. After a typically slow start, Bolt surged through the field to win by a clear metre ahead of Michael Rodgers (9.90) and Nesta Carter (9.94). A total of five men went sub-10. Fellow Jamaican Warren Weir took the 200m in style with a 19.87 clocking as Nickel Ashmeade ran a season's best of 19.93 back in second. There was even more Jamaican joy in the women's 100m as Shelly-Ann Fraser-Pryce dominated the race from start to finish and set a new meeting record with her 10.72 - achieved against a marginal headwind. Dawn Harper-Nelson's 12.48 in the 100m Hurdles was too hot for Sally Pearson, although the Australian is showing decent form once again after returning from her injury problems earlier in the year. The passionate Belgian crowd did not witness a win for the Borlee family in the 400m as Great Britain's Martyn Rooney dipped to perfection on the line to beat Jonathan Borlee; both were given the same time of 45.05. In the men's Shot Put, Ryan Whiting only needed one big effort of 21.45m to take victory while Sandra Perkovic continued her superb run with yet another Discus triumph - this time thanks to a first-round 67.04m throw. Elsewhere in the field, a meeting record of 5.96m was established in the Pole Vault as Renaud Lavillenie soared clear on his 2nd attempt. A closely-fought Javelin saw Tero Pitkamaki (87.32m) narrowly defeat Vitezslav Vesely (86.67m) however the latter took the overall Diamond League crown. On the first of two Diamond League Finals, there were some fascinating head-to-heads culminating in tightly fought battles for the all-important overall titles and a sizeable winning purse. The Shot Put provided two fantastic performances as Valerie Adams went out to 20.98m to improve her world-leading mark and set a new meeting record, while Ryan Whiting went over 22m with a superb 22.03m effort in the 4th round to win by almost a metre. Robert Harting suffered a rare defeat in the Discus, losing to Gerd Kanter, who managed a season's best of 67.02m against the World Champion's 66.83m. There was a breakthrough for Zarck Visser of South Africa, who set a new PB of 8.32m to win the Long Jump in style. Silke Spiegelburg enjoyed a perfect card up to and including 4.79m to take maximum points in the Pole Vault and secure the overall Diamond League crown. Bohdan Bondarenko again attempted a world record of 2.46m in the High Jump but retired after one attempt having already won the competition with a first time clearance at 2.33m. The Women's Javelin was won by Mariya Abakumova with 68.94m, however it was 2nd-placed Christina Obergfoll who took the Diamond League honours. 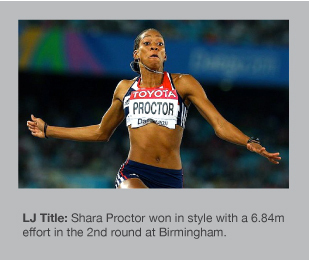 In the evening's last field event, Shara Proctor's 6.88m was enough to beat Blessing Okagbare and overhaul the Nigerian in the race to win the Diamond League. On the track, LaShawn Merritt and Kirani James served up a classic 400m with the former prevailing in 44.13 against the Olympic Champion's 44.32. In another titanic clash, Meseret Defar (14:32.83) defeated compatriot Tirunesh Dibaba over 5000m after a scorching final lap. Shelly-Ann Fraser-Pryce won the 200m in 22.40 and Zuzana Hejnova continued her dominance of the 400m Hurdles - this time with a 53.32 clocking. Silas Kiplagat needed a season's best of 3:30.97 to beat eventual Diamond League winner Ayanleh Souleiman in the 1500m. There was no sub-13 time for David Oliver in the 110m Hurdles but he did take victory in 13.12 which saw an American 1-2-3. In a Men's 100m where 10.07 was only good enough for 9th place, Usian Bolt surged back from a poor start to record another win in 9.90 ahead of Nickel Ashmeade's 9.94. Justin Gatlin and Jimmy Vicaut also dipped under 10 seconds. Eunice Sum (1:58.82) held off Mariya Savinova in an epic finish to the Women's 800m. The 2013 Diamond League series concludes in Brussels next Friday 6th September. There were mixed fortunes for the recently-crowned World Champions from Moscow on a chilly evening in Stockholm at the 12th Diamond League meeting of the 2013 season. Those gold medallists who shone included David Oliver, who took victory in the 110mH with 13.21, Eunice Sum, winning over 800m in 1:58.84 and Valerie Adams who won her 40th straight Shot Put competition with a best of 20.30m. Caterine Ibarguen managed 14.61m to win the Triple Jump by over half a metre, Svetlana Shkolina took maximum points in the High Jump with a 1.98m countback triumph and the 400m Hurdles was won yet again by Zuzana Hejnova - this time in a meeting record of 53.70. LaShawn Merritt looked impressive with a comfortable 44.69 clocking to win the 400m. Meseret Defar set the only world-leading mark of the evening as the Ethiopian won the 3000m in 8:30.29 with the next four athletes - including Mercy Cherono in 2nd (8:31.23), all recording lifetime best performances. Three athletes were crowned as 2013 Diamond League champions - Valerie Adams (Shot Put), Zuzana Hejnova (400m Hurdles) and Maria Abakumova (Javelin), who won with a new meeting record of 68.59m. The Diamond League now moves to Zurich for the penultimate meeting of the series on Thursday 29 August and the first of two Finals events where double points are up for grabs. It was fitting that the last two finals saw the two most successful athletes at the 2013 World Championships pick up their third gold medals in the 4 x 100m relays. First it was Shelly-Ann Fraser-Pryce who added relay gold to her 100m and 200m titles as she anchored her Jamaican quartet to a championship record of 41.29 to defeat France and the USA, who had a terrible 2nd change but fought back well to take the bronze. The French team were later disqualified, promoting Great Britain to the bronze. Usain Bolt then brought home the Jamaican men's team to victory although the USA will point to a terrible final change, which saw them lose significant ground. 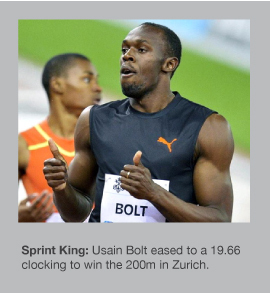 The winning time of 37.36 was a world-leading clocking. Great Britain was disqualified after finishing third and their bronze then awarded to Canada - the baton change to James Ellington on their 2nd changeover took place outside the designated box. A largely predictable Men's 1500m saw world number one Asbel Kiprop cruise across the line with plenty to space as he timed his fnish to perfection coming off the last bend. In a slow race, which was won in 3:36.28, Matthew Centrowitz took silver for the USA and South Africa's Johan Cronje stormed home on the inside to grab an unlikely but excellent bronze. The last individual track final had a dramatic late twist as Eunice Sum passed pre-race favourite Mariya Savinova to win in 1:57.38 - a time that smashed her previous PB by almost 2 seconds. The USA's Brenda Martinez won bronze, getting the better of compatriot Alysia Johnson Montano on the line with the top four all under 1:58mins. The capacity crowd was treated to two exceptional field events to round off proceedings in the Luzhniki Stadium. After many near misses it was fitting that Christina Obergfoll came away with a global title a few days before her 32nd birthday. She triumphed in the Javelin after a huge 2nd round effort of 69.05m, followed by Kim Mickle, who threw a 66.60m PB, and Maria Abakumova's 65.09m for bronze. Having enjoyed some enormous no-jumps in recent weeks, Teddy Tamgho got it right when it mattered the most with a final round best of 18.04m (+0.3m/s) to win the Triple Jump and become only the third man in history to go over the magical 18m barrier. Pedro Pichardo was just 1cm short of his lifetime best with 17.68m for silver, while Will Claye came away with the bronze after his 17.52m. Olympic and World champion, Christian Taylor, didn't even make the podium and managed a below-par 17.20m. Russia topped the medal table with 7 golds and a total of 17 medals, with both the USA and Jamaica taking home 6 golds. The next World Championships will be held in Beijing during 2015. Usain Bolt duly collected his 2nd gold of the 2013 World Championships with a clinical display in the 200m Final, winning in a world-leading time of 19.66. In a Jamaican 1-2, Warren Weir collected the silver after breaking his PB with a 19.79 clocking. A strong finish from Curtis Mitchell gave the American a well-deserved bronze (20.04). There was no medal for 19-year-old Adam Gemili, who ran 20.08 but enjoyed a superb couple of days running under 20secs to win his semi-final yesterday. In a fascinating head-to-head which was too close to call beforehand, Brianna Rollins just got the better of Sally Pearson in the 100m Hurdles, storming to a 12.44 winning time against the Australian's 12.50. The bronze went to Great Britain's Tiff Porter in a new PB of 12.55. Meseret Defar took 5000m gold in 14:50.19, pulling away in the final 200m to defeat Kenyan Mercy Cherono (14:51.22) and her compatriot Almaz Ayana (14:51.33). The Women's 4 x 400m will go down as one of the most exciting races of the entire World Champs, with Russia and the USA battling it out along the home straight. Antonina Krivoshapka had just enough to hold off Francena McCorory and win gold for the Russian quartet in a 2013 world best time of 3:20.19 against the 3:20.41 posted by the USA team. Great Britain came through to grab bronze (3:22.61) thanks to an excellent anchor leg by Christine Ohuruogu. There was another Russian victory in the High Jump although not the name most people were expecting. With Anna Chicherova exiting the competition at 2.00m having cleared 1.97m, it was Svetlana Shkolina who seized the moment and cleared 2.03m at the first attempt to secure a hugely popular gold as well as a new PB. Brigetta Barrett (USA) took silver with a best of 2.00m, while Chicherova shared the bronze with Spain's Ruth Beitia. Vitezslav Vesely's first round throw of 87.17m ultimately won the Men's Javelin however Tero Pitkamaki got within 10cm with a third round effort of 87.07m. In a dramatic last couple of rounds, Julius Yego smahed the Kenyan national record with 85.40m to move into bronze position only for Dmitri Tarabin to overtake him with his final throw of 86.23m to the delight of the near capacity crowd within the Luzhniki Stadium. The day had started with Uganda's Stephen Kiprotich adding the World Marathon title to his Olympic crown he won last summer in London with a time of 2:09:51. Ethiopians occupied the next four places with Lelisa Desisa (silver) and Tadese Tola taking the minor medals. Shelly-Ann Fraser-Pryce and Mo Farah won their respective 200m and 5000m Finals this evening to complete memorable doubles on the 7th day of the World Championships in Moscow. There was added drama in the Women's 200m Final as an injury to Allyson Felix saw her crash to the floor after just 50m, leaving Fraser-Pryce (22.17) to fight off Murielle Ahoure and Blessing Okagbare (both 22.32) for the gold. The Men's 5000m result never really looked in doubt despite the best efforts of Hagos Gebrhiwet, Isiah Koech and Thomas Longosiwa, who all pushed the Briton to his absolute limit in the final 100m, Farah winning in 13:26.98. The session's three field events were all exciting affairs as Aleksandr Menkov increased the world-leading mark on two occasions with 8.52m and then 8.56m with his 5th attempt to secure a popular victory in the Luzhniki Stadium. Ignisious Gaisah broke the Dutch national record, jumping 8.29m to take the silver while Luis Rivera took bronze (8.27m). Tatyana Lysenko and Anita Wlodarczyk had a fascinating duel in the Women's Hammer Final, with the lead changing hands in rounds 3 and 4 as Lysenko ultimately went out to 78.80m - a Championship record - to clinch the title. Wlodarczyk had to settle for a Polish record of 78.46m, and Wenxiu Zhang picked up the bronze for China with 75.58m. David Storl took Shot Put glory thanks to a 21.73m 4th round effort (a season's best for the German) and Ryan Whiting's 21.57m opener was good enough for the silver. Behind the American was Dylan Armstrong, who looked delighted with his bronze (21.34m SB). While the day's last final, the Men's 4x400m relay, was predictably won by the USA quartet in a world-leading 2:58.71, Russia and Jamaica fought out a titanic battle to contest the minor medals with the Jamaicans prevailing by just 0.02sec (2:59.88 to 2:59.90). The British team just missed out in 4th place (3:00.88). Another six gold medals were awarded this evening on yet another entertaining night in Moscow, Russia although one particular athlete stole the show with a breathtaking display in the High Jump. Bohdan Bondarenko repeated his remarkable 2.41m clearance from earlier in the season at Lausanne to take gold. Even more amazing was his decision to pass at 2.38m, which almost backfired as he failed his opening effort at 2.41m before sailing clear at the 2nd attempt. In arguably the greatest High Jump competition in history (and only the 2nd time that three jumpers have gone over 2.38m in the same event), Mutaz Essa Barshim cleared 2.38m to take silver while Canadian Derek Drouin matched that to win bronze. Ivan Ukhov could not give his home fans a medal to celebrate but he did manage a 2.35m season's best. Caterine Ibarguen equalled the 2013 world-leading mark of 14.85m as the Columbian took victory in the Triple Jump. Ekaterina Koneva finished just 4cm behind her to grab the silver and Olha Saladuha had to settle for bronze (14.65m). A thrilling Men's 3000m Steeplechase Final saw Ezekiel Kemboi surge clear in the closing stages to claim another World title in 8:06.01. Conseslus Kipruto made it a Kenyan 1-2 and Mahiedine Mekhissi-Benabbad claimed the bronze to prevent a clean sweep for the East African nation as Paul Kipsiele Koech missed out in 4th place. A stunning world-leading time of 52.83 from Zuzana Hejnova saw the Czech star win the 400m Hurdles by well over one second ahead of Dalilah Muhammad (54.09) and Lashinda Demus (54.27). Hejnova just missed out on a place in the all-time Top 10 with that run. 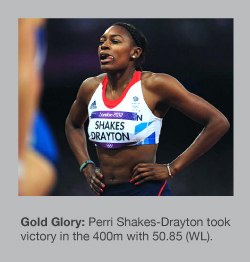 Perri Shakes-Drayton had been widely tipped for a medal but faded in the last 150m to jog home in 7th (56.25). The men's race could hardly have been more exciting. Jehue Gordon and Michael Tinsley battled it out with a photo finish needed to determine the new World champion. In the end, it was Gordon who took gold (47.69 WL) by 0.01sec, however Emir Bekric celebrated like he had won the race; the Serbian taking bronze from the outside lane, running a national record of 48.05 to deny Omar Cisneros. The day's last race, the Women's 1500m, went to the form book as Abeba Aregawi ran a tactically perfect race to win in 4:02.67. Jenny Simpson took silver for the United States and Hellen Obiri brought Kenyan another medal back in 3rd. Elena Isinbaeva sent the packed Russian crowd home delirious as their heroine delivered on the global stage to win gold on the fourth night of action in Moscow at the 14th World Athletics Championships. All of her many world records and medals from the past seemed irrelevant this evening as she sought a World title at the age of 31 in front of her adoring fans. When she cleared 4.89m at the first attempt to take the lead, the noise was deafening all around and a real sense that victory was almost there. Suhr and Silva both failed at this height with the former taking silver on countback. Three unsuccessful attempts at a new world record of 5.07m did not dampen the party atmosphere as the poster girl of the World Champs claimed a memorable triumph. The evening's other field event was won by Robert Harting as the German Discus star took gold with his 4th round throw of 69.11m, backed up by his final effort (69.08m). Piotr Malachowski did his best to take the title and managed 68.36m in round 5 to put pressure on Harting. Legend of the sport, Gerd Kanter, took bronze with 65.19m at the age of 34. Following a frantic 800m race that saw the top eight all set PBs, Ganna Melnichenko (6586pts) was announced as the World Heptathlon Champion. In the end, the top five all recorded new lifetime best points totals. Brianne Theisen Eaton - wife of newly-crowned Decathlon champion Ashton, took the silver (6530pts) and Dafne Schippers broke the Dutch national record with her 6477pts to deny German Claudia Rath, who missed out by just 15pts. Young Brit Katarina Johnson-Thompson impressed over the two days and her reward was 5th place and 6449pts. In a perfectly-timed finish, Mohammed Aman overhauled Nick Symmonds to win the 800m gold in 1:43.31 (SB) with Ayanleh Souleiman claiming the bronze (1:43.76). World-leader Duane Solomon faded to 6th in the closing stages. The Women's 3000m Steeplechase was won by Milcah Chemos Cheywa in a thrilling finish with the fastest clocking of the year (9:11.65). In a Kenyan 1-2, Lidya Chepkurui took silver and Sofia Assefa recovered from a fall with 700m to go to grab a deserved bronze. The day's last final - the Men's 400m, provided one of the most incredible performances of the World Champs so far. LaShawn Merritt stormed clear of the field with 100m left to win by a huge margin, taking 0.01sec from his PB, whilst also registering a 2013 world best performance. Tony McQuay (44.40 PB) made it a 1-2 for the USA and a resurgent Luguelin Santos finished third in 44.52 for the bronze after closing down Jonathan Borlee. The big shock was Kirani James' failure to stay with the pace and drifting backwards to cross the line in 7th place (44.99). Russia achieved a 1-2 in the day's early final, the 20k Race Walk, where Elena Lashmanova (1:27.08) just hang on as compatriot Anisya Kirdyapkina closed strongly down the home straight to finish just 3 seconds adrift. Vera Sokolova was disqualified entering the stadium preventing a Russian clean sweep, and the beneficiary was Chinese walker Hong Liu, who moved up to collect the bronze. On an evening when a total of six gold medals were awarded in Moscow, there was drama in every event on a magical night of pure athletics brilliance. The Women's 100m was a wide-open affair with a number of the finalists capable of taking the title. In the end, it was Shelly-Ann Fraser-Pryce who took the glory with a scintillating 10.71 WL performance to streak away from her rivals. Behind her, Murielle Ahoure took silver in 10.93 and Carmelita Jeter won a well-served bronze with 10.94. Raphael Holzdeppe provided a shock in the Pole Vault as hot favourite Renaud Lavillenie failed to win the title he so badly craved after missing out on the gold two years ago. Both cleared 5.89m however it was the German who cleared at the first attempt to seal the triumph. Bjorn Otto took bronze with a best of 5.82m. There was no such surprise in the Women's Shot Put with Valerie Adams winning thanks to a 20.88m effort in the third round, although Christina Schwanitz managed a huge 20.41m PB in the final round to take silver and close the Kiwi's margin of victory. Krisztian Pars lost his long unbeaten run in the Hammer as Pawel Fajdek launched the Hammer out to 81.97m for a world-leading mark and an emphatic win. Pars took silver with a 80.30m throw. There was almost an American 1-2-3 in the 110m Hurdles as David Oliver won in 13.00 (the quickest in 2013 so far), Ryan Wilson took silver (13.13) and Sergey Shubenkov delighted his home crowd with the bronze (13.24), with Jason Richardson finished just behind the Russian. World record holder and Olympic Champion, Aries Merritt, could only manage 6th place in 13.31 after his indifferent season following injury. By far the most dramatic finish was provided in the Women's 400m Final, which saw Christine Ohuruogu run the perfect race to close in on Amantle Montsho and just pip her to the line by 0.004secs to break the long-standing British record with 49.41. Montsho was awarded the same time, while Antonina Krivoshapka came through strongly to take the bronze in a time of 49.78. In the Heptathlon, Ganna Melnychenko has a 75pt lead overnight after 4 of the 7 events (3912pts), with Dafne Schippers in 2nd place, just 1pt ahead of Sharon Day. Delivering when it truly mattered, Usain Bolt won the 100m World title in Moscow this evening in a time of 9.77. The rain started to come down shortly before the Final got underway and the Jamaican powered home against the elements in the last 30m to defeat Justin Gatlin (9.85) and Nesta Carter (9.95). Four of the top were from Jamaica with Kemar Bailey-Cole and Nickel Ashmeade finishing 4th and 5th. Earlier in the evening, Brittney Reese had successfully defended her Long Jump crown with a 7.01m effort in the 2nd round ahead of Blessing Okagbare, who managed a best of 6.99m to push the American al the way. Another athlete from the US struck gold as Ashton Eaton convincingly took the Decathlon title in style with a points total of 8809. Michael Schrader (8670 PB) and Damian Warner (8512 PB) enjoyed great success over the two days of action and took the minor medals behind Eaton. There was joy for the Russian crowd with Aleksandr Ivanov setting a PB of 1:20.58 to win the 20km Race Walk from Ding Chen of China. Sandra Perkovic continued her dominance of the Discus in 2013 with another commanding victory - this time with 67.99m in round 2. Her winning margin was almost 2m in the end, although Melina Robert-Michon managed a new French record with her 66.28m last round throw to take silver. The Women's 10,000m was won by Tirunesh Dibaba in a time of 30:43.35 with Gladys Cherono and Belaynesh Oljira taking the minor medals for Kenya and Ethiopia respectively. Mo Farah enhanced his credentials as one of the greatest distance runners in recent years with his clinical victory in the 10,000m at the World Championships in Moscow, Russia. After a tactical battle ensued in the first half of the race with the lead regularly changing hands, Farah took control of the race and lead with two laps to go. The result was inevitable however Ibrahim Jeilan and Paul Tanui pushed the Briton all the way in the closing stages, finishing within a few metres of the double Olympic champion. Farah ran 27:21.71 with the two East Africans less than a second behind him at the line. In the day's other final, Kenya's Edna Kiplagat became the first woman to successfully defend their World Marathon crown as she surged past Valeria Straneo with just over a mile to go and the Italian had to be content with a great silver medal. Kayoko Fukushi took the bronze for Japan. The Men's 100m saw Mike Rodgers (9.98) and Justin Gatlin (9.99) dip under 10 seconds to qualify for the semi-finals, while Usain Bolt comfortably won his heat in 10.07. Ashton Eaton regained top spot in the Decathlon after day one with a scorching 46.02 clocking in the last 400m race to take a slender 9pt lead into the second day of action. Compatriot Gunnar Nixon - still just 20 - is just behind Eaton following a fantastic opening day for the young American. One year on from London 2012, there was a truly special atmosphere in the packed Olympic Stadium for the Anniversary Games, where a packed crowd witnessed a fantastic Diamond League event that included five world best performances for 2013 over the two days of action. Arguably the most memorable event was the Men's Pole Vault, which saw Olympic Champion Renaud Lavillenie establish a new Diamond League record of 6.02m (and elevate him to 7th on the all-time lists), before going on to attempt a new World record height of 6.16m. He is showing remarkable consistency around the 5.90m+ range in recent weeks and is certainly the man to beat in Moscow at the forthcoming World Championships. Valerie Adams produced a superb series of throws as she went out to 20.90m in the Shot Put to improve her world best effort, which had previously stood at 20.88m. The Women's 100m saw another world-leading performance - this time in the heats - as Shelly-Ann Fraser-Pryce stormed to a 10.77 clocking (+0.7m/s), which was ultimately in vain. Blessing Okagbare went on to win the 100m final and set her second African record of the day with 10.79 (+1.1m/s) ahead of four sub-11 runs from Barbara Pierre, Kelly-Ann Baptiste, Murielle Ahoue and Fraser-Pryce herself. Two Brits with Olympic gold medals from the past thrilled their home crowd as first Christine Ohuruogu ran a perfect race to win the 400m in 50.00 (SB), and Mo Farah comfortably strode to a 3000m triumph in 7:36.85 (PB) to delight his watching fans. Another highlight was Sally Pearson's return to form following recent injury as she enjoyed success in the 100m Hurdles (12.65) - taking the scalps of Tiff Porter and Kellie Wells. On Friday evening, Shannon Rowbury set a 8:41.46 world best for the 3000m and Zuzana Hejnova looked supreme in her 53.07 run over the 400m Hurdles - a world best for 2013 and Czech Republic national record. Perri Shakes-Drayton improved her PB back in 2nd place with 53.67. Also on Friday night, Usain Bolt took the 100m (run on Friday evening) in 9.85 (+0.2m/s), with Michael Rodgers (9.98) and Nesta Carter (9.99) dipping under 10 seconds. The British Women's 4x100m relay quartet ran their fastest time for 12 years as they took victory in a swift 42.69. Bohdan Bondarenko was in top form again with a 2.38m High Jump clearance, while Erik Kynard pushed him all the way with 2.36m. The Diamond League now takes a break of almost four weeks to make way for the World Championships, which run from 10 - 18 August in Moscow. Action will resume on Thursday 22 August in the Swedish capital, Stockholm. On a warm evening in Monaco, a total of seven world-leading marks were set as the leading athletes geared up for the forthcoming World Championships in superb style. Asbel Kiprop became the fourth-fastest over 1500m in history as he dominated the race to clock a scintillating 3:27.72 while Britain's double Olympic champion Mo Farah achieved a new European record of 3:28.81 in second place to create his own piece of history in an unforgettable finish as he closed in on the Kenyan. Another Kenyan, Edwin Soi, went on to set a new 2013 world best of 12:51.34 in winning the 5000m and Amantle Montsho set a new PB of 49.33 in another commanding 400m performance. Renaud Lavillenie increased his world-leading mark by 1cm as he sailed over 5.96m to delight a large French contingent inside the Stade Louis II before narrowly failing at 6.02m. Elsewhere in the field, Vitezslav Vesely won the Javelin with an impressive 87.68m world-leading throw to displace Tero Pitkamaki. Blessing Okagbare looked like she could threaten Brittney Reese's dominance in the Long Jump after her 7.04m (+2.1m/s) effort won the event - she also jumped a legal 7.00m, and Brigetta Barrett enjoyed High Jump success thanks to a 2.01m clearance. The Triple Jump was slightly below-par in the end as Christian Taylor took victory with a modest 17.30m and the world leader Pedro Pichardo could only manage 16.94m for third. A season's best of 48.00 was neeed by Jehue Gordon as the Trinidad & Tobago star won the 400m Hurdles and Murielle Ahoure set a new national record of 22.24 in the 200m, defeating Tiffany Townsend (22.26) and Shelly-Ann Fraser-Pryce (22.28) in a tight finish. Both 4x100m relays saw world-leading marks for the respective 'USA Red' teams in 37.58 and 41.75. Justin Gatlin anchored the men's quarter before going on to win the individual 100m in 9.94. Another American enjoyed a great evening in Monaco with Duane Solomon (1:43.72) holding off Pierre-Ambroise Bosse in the 800m - the Frenchman having to be content with a 1:43.76 PB in second. The Diamond League moves to London for the Anniversary Games, which will be held over two days from 26-27 July. Emotions ran high in the heat of Birmingham on the final day of competition at the British Championships, which threw up some fantastic performances along with several other talking points. James Ellington took victory in the 200m with a 20.45 run aided by a +2.4m/s following wind. Behind him, Richard Kilty stormed to a 20.50 clocking and Delano Williams finished strongly after a terrible start to grab third with 20.58. In the Women's event, Anyika Onuora also benefited from an illegal wind (+2.5m/s) to record an impresive 22.71 winning time - Asha Philip having to settle for second place after her 100m triumph yesterday. A 6th national title for Michael Rimmer came his way thanks to a 1:47.79 run in the 800m, holding off Mukhtar Mohammed in the last 50m as the Sheffield athlete closed to within 0.07sec of Rimmer. William Sharman equalled his season's best of 13.44 to win the 110m Hurdles while Nigel Levine took the 400m crown in a fiercely competitive race, which saw him achieve the 'A' standard for Moscow. Perri Shakes-Drayton went off very hard in her 400m Hurdles final and faded in the latter stages but still managed a swift 54.36. Eilidh Child had to settle for silver in 54.90. In the field, Brett Morse put nearly 8m between him and his nearest rival as the Birchfield man enjoyed a best of 62.05m in the first round to seal a convincing win. Robbie Grabarz (2.28m) and Tom Parsons (2.25m) were the top two in the High Jump and Shara Proctor won a high-calibre Long Jump competition with 6.84m, however she did go out to around 7m with a marginal foul in the third round before retiring. Julian Reid outjumped Nathan Douglas by just 5cm as he bounded out to a season's best effort of 16.79m in the Triple Jump. The Women's 1500m provided its fair share of upsets as both Lisa Dobriskey and Laura Weightman failed to finish the race - Dobriskey pulling up after 600m and Weightman being involved in a fall that saw her leave the stadium in tears clutching her knee. This all left Hannah England to comfortably take the win in 4:10.99. On a dramatic day of action at the British Athletics Championships in Birmingham, England it was James Dasaolu who provided the main talking point as the in-form sprinter produced a thrilling run to win his 100m semi-final in 9.91 (+1.1m/s) to make thim the fourth fastest man of 2013 - just ahead of Olympic champion and World record holder, Usian Bolt. 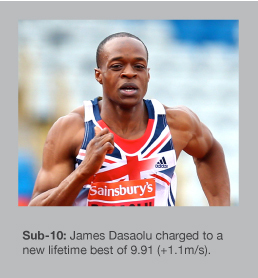 Dasaolu almost became the second fastest Briton of all-time (behind Linford Christie) although he cited cramp as the reason why he didn't take his place in the final, which was won by a resurgent Dwain Chambers in a season's best of 10.04 (+1.9m/s). Harry Aikines-Aryeetey managed a new PB (10.08) to put him in contention for Moscow, where the World Championships will be held in August. Dai Greene was an impressive winner of the 400m Hurdles in 48.66 SB as Rhys Williams pushed him all the way and had to be content with a new lifetime best run of 48.85. It was business as usual for Tiff Porter in the 100m Hurdles - this time she clocked 12.68 (+0.6m/s) to dominate the field and take victory by exactly half a second. Chris Tomlinson did not manage the Long Jump 'A' standard but did triumph with his best effort of 8.03m in the first round against a -1.4m/s headwind. There was no win for Jess Judd over 800m as Marilyn Okoro showed her strength and class to pull away from the teenager in the final 200m to record a 2:00.60 performance ahead of Judd's 2:02.81. Luke Cutts cleared 5.65m at the first attempt to defeat rival Steve Lewis (also 5.65m) on countback. The Women's 400m saw Christine Ohuruogu cruise to 50.98 with Shana Cox (51.76 SB) back in second place. Asha Philip secured her place on the plane for Moscow after her excellent 11.20 win in the 100m (-0.2m/s). A total of four world-leading marks were set in the French capital of Paris on a memorable night of Diamond League athletics at the Stade de France. Usain Bolt had recently been removed from top of the 200m rankings following Tyson Gay's 19.74 clocking to win the US Champs and he was intent on regaining the number one spot, which he duly achieved with his 19.73 (+0.2m/s) to defeat fellow Jamaican Warren Weir, who also went under 20 seconds (19.92). A season's best of 20.07 made it a decent evening for French sprint star Christophe Lemaitre. The Men's 400m promised much and delivered a superb finish with Kirani James running a world-leading 43.96 to narrowly beat LaShawn Merritt (44.09). World record holder Tirunesh Dibaba showed her class with a fantastic 14:23.68 win over 5000m - the seventh fastest time ever. The large crowd of almost 40,000 witnessed the first sub-8 time of the season in the Men's 3000m Steeplechase, where Ezekiel Kemboi surged home to 7:59.03, which was also a meeting record. Another strong run from Zuzana Hejnova gave the Czech Republic athlete victory in the 400m Hurdles - this time in a new national record of 53.23. Perri Shakes-Drayton was second in 53.96. Francine Niyonsaba impressed with her 1:57.26 win over 800m as the first three all went under 1:58. The Women's 100m saw Shelly-Ann Fraser-Pryce run a season's best of 10.92 with Blessing Okagbare losing out by just 0.01sec. Robert Harting took the Discus win courtesy of a 67.04m best throw in the penultimate round while, elsewhere in the field, Renaud Lavillenie cleared 5.92m in front of his home crowd and Anna Chicherova went over 2.01m to triumph in the High Jump. A 13.09 outing for Aries Merritt in the 110m Hurdles showed he is back to near his best following recent injury problems. Frenchman Pascal Martinot-Lagarde smashed his PB behind the American, running 13.12. 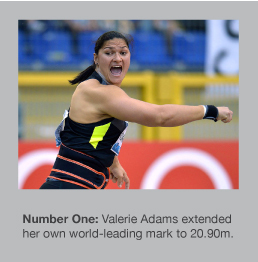 Valerie Adams notched up another success with her commanding 20.62m effort in the Shot Put. The Diamond League returns on Friday 19 July in the unique setting of Monaco for the 10th meeting of the 2013 series. The field events provided two of the highlights in Lausanne, Switzerland as Bohdan Bondarenko elevated himself into the world's top 10 of all-time with his magnificent 2.41m clearance at the Diamond League meeting, while Sandra Perkovic threw a world-leading mark of 68.96m in the Discus. Bondarenko rose to equal third place and behind only the legendary Javier Sotomayor and Patrick Sjoberg. He even had three decent attempts at a new World record height of 2.46m. His PB has risen by 10cm in the past year and, at still only 23, he seems destined for greatness if he can continue his current form into the next couple of seasons. There was a new PB of 2.37m for Erik Kynard behind the Ukrainian star. The Women's Discus saw Perkovic extend her own world-leading mark and get close to her lifetime best as she enjoyed a duel with Yarelis Barrios - the Cuban achieving a season's best of 67.36m for second. Tyson Gay run another sub-9.80 clocking with his winning 9.79 (aided by a perfect +2.0m/s following wind) ahead of Asafa Powell's 9.88 SB and Michael Rodgers, who ran 9.96. Despite running a national record of 9.97, Kim Collins had to be content with fourth place. The Women's 400m was decided by just 0.01sec as Amantle Montsho lost by the same margin for the second time in under a week - this time to the USA's Francena McCorory (50.36). Mariya Ryemyen looked shocked as she took victory in the 200m thanks to a season's best performance of 22.61 to defeat a high-calibre field. A thrilling finish to the Women's 3000m Steeplechase saw Hiwot Ayalew (9:17.66) get the better of her Ethiopian compatriot Sofia Assefa (9:17.69), and there was another victory for Ethiopia in the Men's 5000m, which saw Yenew Alamirew and Hagos Gebrhiwet going head-to-head over the final lap. This time it was Alamirew who triumphed in 13:06.69. With pre-meeting excitement about who would come out on top between Teddy Tamgho and Christian Taylor in the Triple Jump, it was actually Pedro Pichardo who prevailed after his 17.58m best effort. Tamgho managed 17.40m for a solid second place while Taylor was disappointing down in third with 17.13m. A season's best of 48.14 was enough for Javier Culson to win the 400m Hurdles, while David Oliver set a world-leading time of 13.03 (+0.9m/s) inthe 110m Hurdles to confirm he's back in form ahead of the World Championships. Mohammed Aman took the 800m in 1:43.33 SB and Sally Pearson struggled again, coming seventh in the 100m Hurdles (12.69) behind winner Dawn Harper-Nelson (12.53 SB). Abeba Aregawi (1500m victory in 4:02.11) and Sandra Perkovic (Discus) have now secured the Diamond League titles in the their respective disciplines. The next Diamond League meeting take place in Paris on Saturday evening, with a star-studded line-up ready to compete in the Stade de France. It was largely a day of shocks in Birmingham as many of the leading names were defeated on a glorious sunny afternoon at the Diamond League meeting. There was, however, one star who put in a hugely memorable performance on the big stage as Mo Farah delivered a decisive kick in the final straight of the Men's 5000m to hold off Yenew Alamirew and secure a crowd-pleasing victory for those in the packed Alexander Stadium. Farah covered the final lap in just 52.36 to reinforce his sprinting prowess and he proved too hot for a very strong field. Other notable wins for the British athletes in attendance came from the female trio of Jessica Judd, Perri Shakes-Drayton and Christine Ohuruogo. Judd, who followed up her recent European Team Championships success over 800m to run a lifetime best of 1:59.85 and defeat her rivals with a finely-timed strong finish, while Shakes-Drayton produced a season's best 53.82 to take the 400m Hurdles ahead of Eilidh Child, who again broke the Scottish record with her 54.22. Ohuruogo left it late but overhauled Amantle Montsho in the final strides to record a pleasing win for the Briton in 50.63. Christian Taylor went out to 17.66m in the Triple Jump to come within 3cm of the 2013 world's best distance but Teddy Tamgho pushed the American with an effort of 17.47m in the third round. A couple of enormous no-jumps followed for Tamgho, who showed he is well and truly back to form after his long-term injury problems. In the Long Jump Aleksandr Menkov showed remarkable consistency as he has done all season to win with another 8.20m competition. This time he had to settle for 8.27m as Britain's Olympic champion Greg Rutherford managed 8.11m for second place. The Men's 100m saw Nesta Carter register a sub-10 clocking as the Jamaican scorched to a 9.99, however James Dasaolu pushed him all the way and was roared on by his home crowd to a new PB of 10.03. Bohdan Bondarenko cleared 2.36m at the first attempt to establish a new High Jump stadium record and smash his PB in the process. The other meeting record fell to Milcah Chemos as the Kenyan ran 9:17.43 in the 3000m Steeplechase. Both Olympic champion sprint hurdlers Sally Pearson and Aries Merritt were well beaten in their respective events with the former coming fourth in a distinctly average 12.73. Dai Greene finished down in fitfth in the 400m Hurdles, which Javier Culson won in 48.60, while Carmelita Jeter faired even worse, coming seventh in the 200m as Blessing Okagbare took the victory in 22.55. The Diamond League now moves into the second half of the 2013 series with the eighth event of 14 taking place in the picturesuque Swiss city of Lausanne next Thursday evening. Russia claimed victory after a thrilling final day of competition in the European Team Championships with a total points haul of 354.4pts, ahead of Germany (347.5pts) and Great Britain (338pts). France had a solid two days with 310pts back in 4th overall. Dmitry Tarabin threw a PB of 75.99m to win the Javelin, Maria Kuchina cleared 1.98m (PB) for High Jump success and Aleksey Fyodorov managed a 16.70m effort to take maximum points in the Triple Jump as the Russian team enjoyed a fantastic day two. Sergey Shubenkov looked impressive with his 13.19 (+2.4m/s) win in the 110m Hurdles. Germany pushed Russia all the way and star performers such as Robert Harting (64.25m in the Discus), Christina Schwanitz (19.30m to win the Shot) and Betty Heidler (Hammer victory with 74.31m) delivered when it mattered. There were some excellent performances from the Great Britain team with 12pts from both 4x400m relay teams as well as Tiff Porter in the 100m Hurdles (12.62) aided by a +2.6m/s following wind. Sophie Hitchon set a new national record in the Hammer with her 72.97m effort in the 3rd round to claim a deserved 3rd place overall. France had a decent final day thanks to some of their big guns including Christophe Lemaitre, who won the 200m in 20.27 (+2.4m/s), Renaud Lavillenie (Pole Vault win with 5.77m) and Bouabdellah Tahri (8:05.31 for 3000m victory). Eloyse Lesueur caused a slight upset in the Long Jump as she defeated both Shara Proctor and Darya Klishina with her best leap of 6.44m. An exciting first day of action at the European Team Championships in Gateshead, England saw Germany (195pts) take a slender 1pt overnight lead into the second and final day of competition ahead of Russia (194pts) and Great Britain (181pts). Germany enjoyed a total of four victories on day one, Russia also four and Great Britain five. Mo Farah provided one of the day's highlights with a scintillating final lap of 50.89 to easily win the 5000m in 14:10.00. 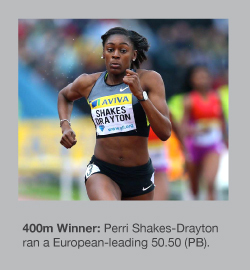 Perri Shakes-Drayton (50.50 EL) smashed her PB to win the 400m and Eilidh Child ran 54.42 to also take a similar margin off her PB for a memorable success in the 400m Hurdles. The other two British successes were in the Women's 800m where teenager Jessica Judd just held off Ekaterina Sharmina to win impressively in 2:00.82 and the Men's 4x100m relay quarter, who clocked 38.39 to triumph in style. Russia's winners included Aleksandr Menkov with his 8.36m (+1.9m/s) to defeat Olympic Long Jump champion Greg Rutherford (8.02m). Vladimir Krasnov won the 400m with a late surge and finished with a season's best of 45.69. Elena Korobkina (9:01.45) took the 3000m and Natalia Aristarkhova (9:30.64 for the 3000m Steeplechase) also gave Russia maximum points. The overnight leaders, Germany, enjoyed field successes from Silke Spiegelburg in the Pole Vault (4.60m), David Storl in the Shot Put (20.47m) and Christina Obergfoll's 62.64m Javelin effort, to go with Silvio Schirrmeister's surprise 49.15 PB to beat former World Champion Dai Greene over 400m Hurdles. With the points situation so close going into the second day, all is up for grabs tomorrow. Tyson Gay and Usain Bolt both won their respective 100m national championships to confirm their places for the World Championships in Moscow later in the summer. Gay ran a world-leading 9.75 (the =10th fastest run in history), while Bolt was some way behind with his clocking of 9.94. The wind for the US Champs' 100m final was +1.1m/s, which was in contrast to the -1.2m/s headwind in Kingston, Jamaica - this probably meant that both Gay and Bolt would have been in the 9.8 region in still air. The main casualty was Asafa Powell, who finished 7th in the Jamaican trials after a time of 10.22. Elsewhere, in the Women's 100 finals, Kerron Stewart won the Jamaican title in 10.96 and English Gardner triumphed in the United States with a 10.85 PB ahead of Octavious Freeman (10.87). Fifth place was 10.94, showing the remarkable spread of times under the 11-second barrrier. Tyson Gay followed up his 100m victory with a scorching 19.74 (+1.6m/s) to land the 200m crown and make it a sprint double. There was no title for Allyson Felix in the Women's 200m as Kimberlyn Duncan ran a windy 21.80 (+3.2m/s) with Felix close behind (21.85). Duane Solomon Jnr ran the world's fastest time of 2013 so far with his 1:43.27 ahead of Nick Symmonds and Brandon Johnson, who both dipped under 1:44. Brianna Rollins ran the =3rd fastest time in history over 100m Hurdles as she set a new US national record of 12.26 (+1.2m/s) and continued her remarkable start to the season. There was another world-leading performance for Brigetta Barrett as she cleared 2.04m to win the High Jump. A world-leading 6550pts from Sharon Day secured the US Heptathlon title. On a dry but relatively cold evening in the Norwegian capital, Meseret Defar and Usain Bolt provided the fireworks for the capacity crowd to enjoy at the sixth Diamond League meeting of 2013. Frankie Fredericks had held the previous 200m stadium record of 19.82 but Bolt charged round the bend and into the straight on a mission to establish new figures and he duly delivered with a 19.79 (WL) clocking thanks to an almost-perfect legal following wind of +1.7m/s. The Women's 5000m promised much and didn't disappoint with Meseret Defar storming to a world-leading 14:26.90, which was also the 12th fastest run of all-time. Teenager Conseslus Kipruto continues to impress this season as the Kenyan recorded another win, this time in 8:04.48 after a frantic start that saw the world record under threat before the pace dropped significantly in the final couple of laps. There was no Norwegian joy for the home crowd as double Olympic champion Andreas Thorkildsen could only finish down in sixth place (80.99m) as Vitezslav Vesely took the win with a best effort of 85.96m. The legendary Dream Mile is always an exciting affair and this year it was Djibouti's Ayanleh Souleiman who prevailed in 3:50.53 ahead of two Kenyans - Nixon Chepseba (3:50.95) and James Magut (3:51.11). Ivet Lalova's late surge was enough to give her an impressive 11.04 SB in the 100m to defeat a classy field, while Svetlana Shkolina was too good for Olympic champion Anna Chicherova, as she cleared 1.97m to take victory. Last week's heroics from Piotr Malachowski were not repeated in Oslo as the Discus thrower failed to register a mark as he struggled with a back problem throughout the first three rounds. Gerd Kanter took advantage to win with 65.52m - a season's best for the 2008 Olympic champion. Silke Spiegelburg won the Pole Vault after her jump-off clearance at 4.65m and another German, Christina Schwanitz, won her 12th consecutive meeting of 2013 with another 20m+ plus performance - this time going out to 20.10m. The Women's 400m Hurdles was dominated by Zuzana Hejnova, who crossed the line in a time of 53.60 for her fastest race of the season. In the Triple Jump, Caterine Ibarguen also continued her great 2013 form with a 14.81m jump to defeat Olha Saladuha (14.56m). Great Britain enjoyed two victories courtesy of Tiffany Porter in the 100m Hurdles (12.76) and Shara Proctor in the Long Jump (6.89m). Yeketerina Poistogova won a close 800m (1:59.39) as Nataliya Lupu could not quite hang on to register a win over the two-lap event. There is 17-day break in the Diamond League schedule, due to the European Team Championships from 22-23 June, before the action resumes on Sunday 30 June in Birmingham, England. Usain Bolt suffered a rare defeat over 100m in the Italian capital of Rome this evening as Justin Gatlin held off the Olympic Champion for a narrow victory in the Diamond League meeting. Gatlin secured the win - his fourth from four races in 2013 - in a time of 9.94, while Bolt had to be content with 9.95 and 2nd place. Jimmy Vicaut equalled his PB of 10.02 back in 3rd, ahead of Michael Rodgers' 10.04 clocking. Yenew Alamirew became the first man to go below 13 minutes this year in the 5000m as he prevailed in a thrilling sprint finish to take maximum Diamond Race points with his time of 12:54.95, while Hagos Gebrehiwet had to be content with a season's best of 12:55.73. The 800m was another exciting affair with Mohammed Aman finishing strongly to win in 1:43.61 and Frenchman Pierre Ambroise Bosse smashed his PB by nearly one second to set new figures of 1:43.91, announcing his arrival as a contender for Moscow later in the year. It was business as usual for Amantle Montsho in the 400m as she duly won in a world-leading 49.87, while Dawn Harper was too hot for her rivals over the 100m Hurdles with a winning time of 12.65 - Lolo Jones 2nd in 12.70. Abeba Aregawi won a slow-starting 1500m that wound up in the final lap to give her a relatively swift time of 4:00.23 and her 3rd consecutive Diamond League triumph. There was a shock in the Women's 200m, which saw Allyson Felix (22.64) out-sprinted by Murielle Ahoure (22.36), who set a new national record in the process. Johhny Dutch won a close 400m Hurdles (48.31) and Lashawn Merritt took the honours over the flat 400m with a slightly disappointing time of 44.96. In the 110m Hurdles, Sergey Shubenkov impressed with his 13.20 run. Following a mammoth jump-off which ultimately failed to split Anna Chicherova and Svetlane Shkolina, both tied for first place with a best of 1.98m, while Blanka Vlasic continued her comeback from injury with her 1.95m clearance. One of the most exciitng field events saw Raphael Holzdeppe equal his PB of 5.91m to defeat Renaud Lavillenie in the Pole Vault. Elsewhere in the field, Brittney Reese (6.99m) won an extremely close Long Jump competition which saw 6.87m fail to make the top three. Christian Taylor triumphed in the Triple Jump (17.08m), Sandra Perkovic took the Discus win with 68.25m, the Javelin was won by Christina Obergfoll (66.45m) and David Storl beat a strong Shot Put field with 20.70m. The Diamond League now moves on to Oslo, Norway for the sixth event in the 2013 series on Thursday 13 June. The world's highest jump since 2000 by Mutaz Essa Barshim lit up the Diamond League meeting in Eugene, USA. His stunning clearance of 2.40m puts him just 5cm behind Javier Sotomayor's World Record of 2.45m and the 21-year-old seems set to challenge this mark that has stood since 1993. Erik Kynard and Derek Drouin also improved their PBs by going over 2.36m in one of the highest standard competitions in history. Aleksandr Menkov provided another of the Prefontaine Classic's highlights as he sailed out to 8.39m aided by a legal +1.7m/s wind to win a strong competition that also saw Mauro Da Silva and Greg Rutherford both jump 8.22m. It was the furthest jump since 2011. In another field event classic, Renaud Lavillenie managed a world-leading mark of 5.95m for Pole Vault victory, however he was pushed all the way by Bjorn Otto's 5.90m and clearances of 5.84m from Raphael Holzdeppe and Malte Mohr. Another German, Robert Harting, got close to 70m in the Discus with his winning effort of 69.75m, pushing Piotr Malachowski back to second with his 68.19m. Harting is now unbeaten since August 2010. The Women's Triple Jump was won by Caterine Ibarguen (14.93m), aided by a slightly wind-assisted +2.1m/s breeze. Olha Saladuha came 2nd and her legal 14.85m was enough for a world-lead. Zuzana Hejnova was yet another athlete setting a new world best for 2013 as she took victory in the 400m Hurdles with 53.70. An exciting battle in the 110m Hurdles saw Hansie Parchment take the honours in 13.05, while Orlando Ortega (13.08) and David Oliver (13.10) pushed him all the way. On the track, Francine Niyonsaba scorched to a 1:56.72 (WL) clocking to win the 800m in some style and Silas Kiplagat took the Bowerman Mile in 3:49.48 just ahead of Asbel Kiprop. Double Olympic Champion Mo Farah was defeated over 5000m as Edwin Soi ran a world-leading time of 13:04.75. In the Women's 5000m, Tirunesh Dibaba won with her 14:42.01, and 18-year-old Conseslus Kipruto beat a high-calibre field over 3000mSC in a meeting record of 8:03.59. Lashawn Merritt (44.32) got the better of Kirani James (44.39) in the 400m, while three women went under 10.80 for the 100m albeit aided by an illegal following wind. It was Shelly-Ann Fraser-Pryce who won in 10.71, followed by Blessing Okagbare (10.75) and Veronica Campbell-Brown (10.78). Another Jamaican, Nickel Ashmeade, took the 200m in 20.14. The shorter sprint was taken by Justin Gatlin in a windy 9.88; Michael Rodgers coming home 2nd in 9.94. Amantle Montsho won the 400m in 50.01 and Mohammed Aman finished strongly to record a 1:44.42 victory in the 800m. The Diamond League moves to Europe for the next event, which takes place in Rome on Thursday 6 June. It was business as usual for Croatian High Jump star Blanka Vlasic as she returned from injury to win win a best clearance of 1.94m in New York at the 3rd Diamond League event of 2013. Competing for the first time in 20 months, Vlasic was delighted with her victory, especially as she has been feeling quite a lot of pain when jumping in training. Janay DeLoach Soukup set a meeting record for the Women's Long Jump thanks to her 6.79m effort and Sandra Perkovic established a new world-leading mark with a huge 68.48m Discus throw in the fifth round. Another Olympic Champion, David Rudisha, coasted to a comfortable 1:45.14 as he took victory in the 800m, while Amantle Montsho asserted her dominance on the 400m with yet another sub-50 run - this time it was 49.91 for the 2011 World Champion. Tyson Gay gave his home crowd something to cheer as he won the 100m in 10.02 against a headwind and another American, Ryan Whiting, also enjoyed success with his 21.27m effort in the Shot Put. There was a win for Michael Tinsley in the 400m Hurdles (48.43) and Hagos Gebrhiwet took the 5000m in commanding fashion thanks to a 13:10.03 (WL) run. The Women's Pole Vault went to form as Jenn Suhr triumphed with her best clearance of 4.63m. The Diamond League stays in the USA for the next meeting in the 2013 series, which takes place at Eugene from 31 May - 1 June. 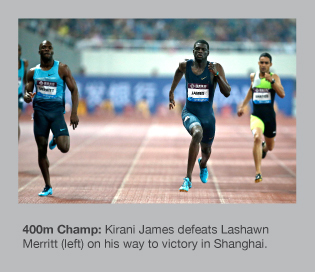 Olympic 400m Champion Kirani James tore apart a high-quality field to light up the 2nd Diamond League event of the 2013 season in Shanghai, China. His winning time of 44.02 matched the meeting record and set a world-leading mark for 2013, with Lashawn Merritt trailing in his wake with 44.60. Another 10 seasonal world bests were set over the course of the meeting, including Li Jinzhe's PB of 8.34m in the Long Jump, which delighted the watching Chinese crowd. Aleksandr Menkov also set a PB as he finished 2nd with 8.31m. Olympic Champion Greg Rutherford has a solid competition with 8.08m for 3rd place. The Men's High Jump saw Mutaz Barshim and Bohdan Bondarenko both clear 2.33m, and Tero Pitkamaki went out to 87.60m (WL) in the Javelin. Genzebe Dibaba tore away from Meseret Defar in the final lap to clock 14:45.93 in the 5000m and Shelly-Ann Fraser-Pryce shone in the 100m, winning in 10.93 ahead of Blessing Okagbare, who ran 11.00. The Women's Triple Jump was won by Columbia's Caterine Ibarguen (14.69m) as Olha Saladuha had to settle for 2nd place with her 14.43m. Zuzana Hejnova managed a world-leading 53.79 in the 400m Hurdles and Francine Niyonsaba showed her class with 2:00.33 to win the 800m. The Men's 3000mSC was won by Conseslus Kipruto in 8:00.16 (WL) and Asbel Kiprop surged through to take victory in the 1500 with his 3:32.96 clocking. Warren Weir triumphed in the 200m (20.18) and Jason Richardson took advantage of Aries Merritt pulling up early in the race to win the 110m Hurdles in 13.28. A huge barrier was broken by Christina Schwanitz in the Shot Put as she went beyond 20m for the first time, going out to 20.12m and 20.20m. Yelena Isinbayeva cleared 4.70m in the Pole Vault to secure victory, although she felt pain in her strapped left ankle and only took two attempts at 4.85m before withdrawing from the competition. Next up is the Diamond League meeting from New York on Saturday 25 May. There were a host of world-leading performances in Doha, Qatar, as the 2013 Samsung IAAF Diamond League got underway in style. David Rudisha looked his usual imperious self as he duly won the 800m in 1:43.87, ahead of Mohammed Aman (1:44.21), however Allyson Felix could not win her 11th straight race in Doha - victory in the 400m went to Amantle Montsho in a swift 49.88, with Felix having to settle for 2nd place in 50.19. Olympic silver medallist Christine Ohuruogu claimed a creditable 3rd after clocking 50.53. A thrilling women's 1500m was won by Abeba Aregawi (3:56.60), however junior athlete Faith Chepngetich Kipyegon broke the Kenyan national record with her 3:56.98 to steal the headlines and give an indication of her enormous potential. Shelly-Ann Fraser-Pryce won the 200m in 22.48 (+2.2m/s). Three men dipped under the 10-second barrier as the men's 100m went to Justin Gatlin in 9.97. 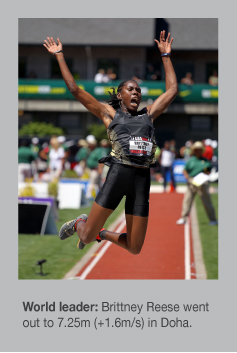 In the field, Brittney Reese smashed her PB thanks to a huge 7.25m (+1.6m/s) leap, which represented the furthest effort in the world for nine years. It was also, of course, the furthest jump seen in the history of the Diamond League. Sandra Perkovic reigned supreme in the Discus with a 67.37m throw to seal victory in the very first round, before going on to extend her best to 68.23m. An enormous 22.28m from Ryan Whiting gave him a resounding triumph in the Shot Put, breaking his PB by a staggering 31cm. 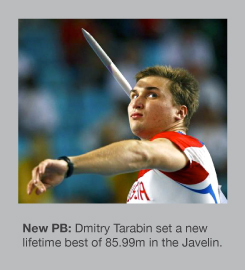 Vitezslav Vesely launched his javelin out to 85.09m to win a slightly below-par competition. Bohdan Bondarenko added 3cm to his lifetime best in the High Jump to clear 2.33m ahead of a high-calibre field. The Diamond League now moves on to Shanghai, China for the next event in the 2013 series, which takes place on Saturday 18 May. 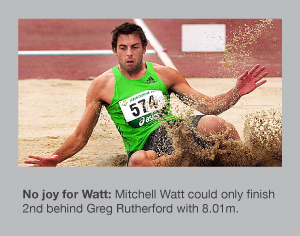 The 2013 World Challenge Series got off to a super start in Melbourne, Australia as Mitchell Watt could not delight his home crowd with victory in the Long Jump - that honour went to Olympic Champion Greg Rutherford, who triumphed courtesy of a 8.10m (+0.6m/s) effort. Watt had to settle for 2nd place with 8.01m, while another Australian, Fabrice Lapierre, was back in 3rd (7.99m). Josh Ross took advantage of a favourable wind to win over 100m in 10.25 (+1.6m/s), and the longer sprint went to Wallace Spearmon, who clocked a time of 20.79 (-1.3m/s) to take the 200m. The 400m was won by Calvin Smith Jnr (46.25) and, elsewhere, Alwyn Jones took the Triple Jump with his best performance of 16.81m (+1.5m/s). The 80m barrier was broken in the Men's Javelin as New Zealander Stuart Farquahar went out to 81.07m and Dusty Jonas topped the High Jump with a 2.25m clearance. There was no hurdles action for Sally Pearson as she helped with the commentary and Asafa Powell was also on hand to raise the profile of this seasonal curtain raiser. 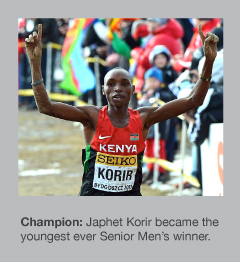 Kenyan teenager Japhet Korir became the youngest ever winner of the senior men's title at the IAAF World Cross Country Championships in Bydgoszcz, Poland today. Defending champion Imane Merga could not repeat his previous victory as he finished six seconds bhind Korir, who covered the treacherous, icy 12km course in 32:45. Eritrea's Teklemariam Medhin took the bronze. Following six consecutive wins in the team competition, Kenya surrendered their crown to Ethiopia - the first time they have taken home the award since 2005. The senior women's race was also won by a Kenyan athlete as Emily Chebet took the honours in exciting fashion with a perfectly-timed finish to overhaul Ethiopia's Hiwot Ayalew to take gold in 24:24. The bronze was secured by Belaynesh Oljira. Hagos Gebrhiwet (Ethiopia) justified his billing as the pre-race favourite to become the junior men's champion, while Faith Chepngetich Kipyegon succesfully defended her title to give Kenya another triumph. A new World Record of 5.02m was set by American Jenn Suhr at the USA Indoor Championships at the Albuquerque Convention Centre this weekend. Incredibly she had no failures whatsover up to and including her record clearance before having three attempts an outright World Record. The previous record, which stood at 5.01m, had been held by the legendary Russian vaulter Yelena Isinbayeva since she established the mark in Stockholm last year. Suhr had already enjoyed a great indoor season with a new national record of 4.88m from Boston one month earlier. It was a truly remarkable card for the London Olympic gold medallist and she will go into the 2013 World Athletics Championships in Moscow as the woman to beat after this superb achievement. In a high quality competition, a further three women went clear at 4.60m to emphasise the calibre of US pole vaulting at the moment. Four titles were decided on the first day of competition in Gothenburg, Sweden at the European Indoor Athletics Championships. Nevin Yanit confirmed her pre-race favourite status in the 60m Hurdles with a European-leading mark of 7.89 to take gold ahead of Ailna Talay, who secured the silver for Belarus. In the men's event, Sergey Shunbenkov, the European outdoor 110m Hurdles champion, struck gold with a world-leading time of 7.49 to defeat Paolo Dal Molin, as the Italian had to be content with a national record of 7.51. Ida Antoinette Nana Djimou retained her Pentathlon crown (4666pts) after holding off Yana Maksimava by just 8pts. Maksimava ran a storming 800m in 2:14.84 to almost overhaul the French athlete, who went into the final discipline with an 88-point lead. Hanna Melnychenko took bronze for Ukraine. Serbia won their first ever European Indoor title thanks to Asmir Kolasinac, who managed a best of 20.62m to become the Shot Put champion. Hamza Alic took the silver with a PB effort of 20.34m while the bronze went to Ladislav Prasil of the Czech Republic (20.29m). There were some scintillating performances to enjoy including a completely dominant display from Abeba Aregawi, who delighted her home crowd by winning the 1500m by a margin. Her time of 4:04.47 was almost 10 seconds clear of 2nd-placed Isabel Macias and Aregawi quickly built up a lead from the gun that grew and grew as the race went on. In a very tight men's 60m final, France's Jimmy Vicaut narrowly held off James Dasaolu as both men clocked 6.48. The women's Long Jump provided one of the day's highlights as Darya Klishina surpassed the 7m barrier for the first time indoors, claiming victory with her best leap of 7.01m in round one. Eloyse Lesueur had to settle for silver but had the consolation of extending the French national record on three occasions, culminating in 6.90m. Daniele Greco produced a huge winning effort in the Triple Jump, smashing his lifetime best and setting a world-leading distance of 17.70m in the process. The silver and bronze medal winners - both from Russia - also secured new personal bests courtesy of Ruslan Samitov (17.30m) and Aleksey Fyodorov (17.12m) respectively. In the vertical jumps, there was joy for Sergey Mudrov, who set a PB of 2.35m to beat his Russian teammate Aleksey Dmitrik (2.33m). The bronze went to Jaroslav Baba of the Czech Republic with 2.31m. Holly Bleasdale won a dramatic Pole Vault as she prevailed over defending champion Anna Rogowska after a jump-off had to separate the two vaulters. Neither could clear 4.72m so the bar went down to 4.67m, and the 21-year-old Briton cleared to secure a very pleasing triumph. A historic first gold for Azerbaijan was achieved by Hayle Abrahimov as he never looked in danger on his way to a 7:49.74 clocking. Juan Carlos Higuero was ecstatic after taking silver and Ireland celebrated bronze with Ciaran O'Lionaird's brave run. On the final day of competition, no less than 15 titles were decided. The morning session saw some thrilling clashes on the track as Perri Shakes-Drayton and Eilidh Child made it a 1-2 for the British team in the 400m. Shakes-Drayton's time of 50.85 was the quickest in the world this year while Child was rewarded with a lifetime best of 51.45. Moa Hjelmer sent the home crowd into raptures with a gutsy bronze and a new national record of 52.04. The men's 400m was dominated by Pavel Maslak of the Czech Republic in 45.66 (new national record) ahead of a delighted Nigel Levine, who took silver in 46.21. There were few surprises in the 800m finals, with Adam Kszczot defending his title in a winning time of 1:48.69. Kevin Lopez and Mukhtar Mohammed took the minor medals. Ukrainian Nataliya Lupu was victorious in the women's event in 2:00.26 however Britain's Jenny Meadows could not make the podium following her comeback from injury as she finished in 4th (2:01.52). Sara Moreira was a comfortable winner of the 3000m (8:58.50), exactly 2 seconds ahead of Corinna Harrer of Germany and Ireland's Fionnuala Britton, who claimed bronze with a storming late run. In the field, Olha Saladuha predictably secured Triple Jump gold with her first round 14.88m (WL) - winning by no less than 58cm, and a dramatic women's Shot Put final saw Christina Schwanitz of Germany go from bronze to gold in the final round with a huge 19.25m effort to push Yevgeniya Kolodko back to silver. The afternoon session provided plenty more excitement as Perri Shakes-Drayton collected her 2nd gold of the day. The British Women's 4x400m team broke their national record and set a new championship record with 3:27.56 ahead of Russia and the Czech Republic. Their male 4x400m counterparts then prevailed in a fast 3:05.78 with Russia once again having to settle for silver. 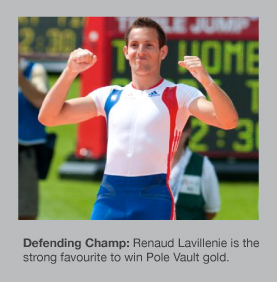 Two of the three field events provided spectacular drama of sorts; Renaud Lavillenie duly took the Pole Vault title with a world-leading 6.01m and then had (what appeared to be) a clearance at 6.07m before it was ruled out for an infringement with the bar bouncing back onto another part of the apparatus. He was understandably distraught but had to be content with a massive winning margin of 25cm (five heights). Home Long Jump hopeful Michel Torneus (8.29m, national record) just missed out on gold as Aleksandr Menkov soared out to 8.31m (WL). The other field final saw Ruth Beitia claim High Jump golf for Spain with a best jump of 1.99m; Sweden picked up both silver and bronze. The Women's 60m proved unbelievably close as just 0.06secs separated all eight finalists. In the end, Tezdzhan Naimova came through to win in 7.10 - the same time as Mariya Ryemyen, who pulled up immediately after the finish clutching her hamstring. Mahiedine Mekhissi-Benabbad times his finish to perfection to win the 1500m in 3:37.17 and Eelco Sintnicolaas set a national Heptathlon record of 6372pts to win by 75pts with France's Kevin Mayer back in silver. Russia topped the medal table win a total of 14 medals (four gold, seven silver and three bronze), while Great Britian and France also picked up four golds. At the final IAAF Indoor Permit Meeting in Stockholm, Sweden the middle and long distance athletes took centre stage with a number of impressive performances. Teenage Ethiopian Mohammed Aman set a new national record and world-leading time of 1:45.05 in the 800m to defeat a strong field including Adam Kszczot and Timothy Kitum by a huge margin of over 1.5secs. Mo Farah's training partner, Galen Rupp, ran a stunning race to take victory over 3000m in 7:30.16 - again setting a national record and improving the world-leading figures in the process. The women's 3000m saw Genzebe Dibaba destroy the field with a blistering 8:26.95 (WL) to set a new meeting record. Her former compatriot, Abeba Aregawi (now competing for Sweden), set the arena alight with the performance of the entire meeting. Her 3:58.40 clocking was just 0.12secs off the world record figures, set back in 2006. Shelly-Ann Fraser-Pryce set a new PB of 7.04 in the 60m as she continued to progress in her first ever indoor season. Mariya Ryemyen took 2nd place with 7.17. Veteran Tia Hellebaut showed decent form in the High Jump, clearing a best of 1.95m to defeat home athlete Emma Green Tregaro. Elsewhere in the field, Yarisley Silva set a world-leading mark of 4.78m in the Pole Vault, while Swede Michel Torneus (8.20m) triumphed in a high-quality Long Jump competition that saw three men go out to beyond 8.10m. There were two All-comers Records set in Birmingham, England as new figures were established in both the 60m and 1500m. The Ivory Coast's Murielle Ahoure claimed the scalps of Shelly-Ann Fraser-Pryce and Carmelita Jeter as she scorched to a 6.99 clocking to dip below the magical 7-second barrier in the 60m while Ethiopian Genzebe Dibaba ran 4:00.83 to claim victory over 1500m. The men's 3000m saw Mo Farah given a hero's reception after his two golds at the London 2012 Olympics and the Briton delivered with an assured piece of running to win in 7:42.00. Farah's teammate Robbie Grabarz could not scale the heights of recent outings as he managed just 2.29m in the High Jump, which was won by Russian Aleksey Dmitrik (2.33m). Ivan Ukhov had to settle for third on countback. Holly Bleasdale got the better of Yarisley Silva in the Pole Vault, enjoying a clear card up to and including 4.70m. Michael Rodgers sprinted to 6.53 in the 60m to beat a quality field including Nesta Carter (6.56) and the St Kitts pairing of Antoine Adams and Kim Collins. American Omo Osaghae set a PB time of 7.51 in winning the 60m hurdles to defeat the fast-improving Russian Sergey Shubenkov. Unsurprisingly Olha Saladuha was a comfortable winner of the Triple Jump (14.61m) but Yamile Aldama proved that age is still no barrier as the Briton jumped a season's best of 13.91m (4th) at the age of 40. After getting over her recent injuries, Jenny Meadows ran a solid 800m to finish 2nd in a time of 2:02.86 in front of her home fans. The 4th IAAF Indoor Permit Meeting took place in Gent, Belgium and Angel David Rodriguez clocked a swift 6.57 in the 60m to defeat Christophe Lemaitre, who finished back in 4th. 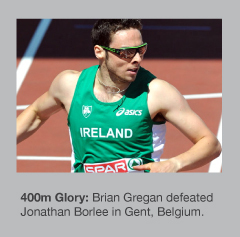 Jonathan Borlee was arguably the favourite going into the 400m but it was Brian Gregan who took the honours in 46.73, narrowly beating the Belgian star (46.83). Italy's Alessia Trost cleared 1.95m in winning the women's High Jump, while an extremely tight finish in the men's 3000m saw Albert Rop (7:39.59) hold off compatriot Paul Koech and Ayanleh Souleiman to record victory. In another incredibly close affair, Yvette Lewis took the 60m Hurdles ahead of Eline Berings and Alina Talay - just 0.02secs separating all three athletes in a photo finish. There was a Kenyan 1-2 in the men's 800m with Abraham Rotich (1:46.75) and Anthony Chemut (1:47.06) well clear of the rest. The series now moves on to Birmingham for the penultimate meeting of the 2013 season on Saturday 16 February. A busy weekend of action saw meetings in Karlsruhe, Boston and Moscow as the IAAF Indoor Permit season got underway in style. In Karlsruhe, Germany Genzebe Dibaba ran to a world-leading 4:02:25 over 1500m and fellow Ethiopian Meseret Defar set a meeting record of 8:35.28 for the 3000m. French Pole Vaulter Renaud Lavillenie was another who established a meeting record as he soared to a 5.83m clearance to take victory. The New Balance Grand Prix in Boston, USA saw Hagos Gebrhiwet, 18, break the world junior record with his awesome 7:32.87 performance in the 3000m. 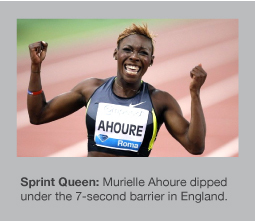 A 60m meeting record went to Murielle Ahoure as the sprinter set new figures of 7.07. 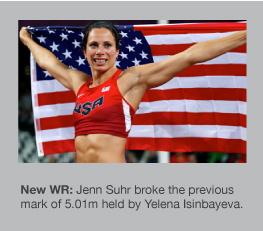 American Jen Suhr delighted her home crowd by setting a world-leading mark of 4.76m to win the Pole Vault. Arguably the most impressive performance of the entire weekend went to Moutaz Barshim Ahmed, who cleared 2.37m in the High Jump. What made his achievement all the more special was a completely clear card up to and including this height. Elsewhere in the field, Olga Kucherenko confirmed her place as one of the world's premier jumpers as she took the honours in the Long Jump with a best of 6.83m. Kim Collins continues to defy age and he was successful over 60m with a quick winning time of 6.57. There are just over two weeks until the IAAF Indoor Permit Meeting season gets underway. The world's finest six indoor ahlletics meetings will take place in Belgium, Sweden, UK, USA, Russia and Germany over the course of a three-week period in February. Three World indoor records were set during the corresponding fixtures last year and it will be fascinating to see how many of the leading contenders fare in this series of 'testers' ahead of the 2013 World Championships in Moscow (August). The action starts on Saturday 2 February in Karlsruhe, Germany, whilst Boston hosts its meeting on the same day in the USA. Moscow is the setting for the famous 'Russian Winter' competition on Sunday 3 February, followed by meetings in Gent, Belgium (Sunday 10 February) and Birmingham, UK (Saturday 16 February) before the series concludes in Stockholm, Sweden on Thursday 21 February. Australian 100m hurdler Sally Pearson has enjoyed a sensational couple of seasons during which she won the 2012 London Olympics (in a new Games record of 12.35, -0.2m/s), the 2012 World Indoor Championships and the 2011 World Championships in Daegu. In winning the World 100m Hurdles crown on 3 September 2011, Pearson became the fourth fastest ever at the discipline and now aged 26, she is approaching the peak of her powers. There is no doubt that Yordanka Donkova's World Record figures of 12.21 are within her sights and the 25-year-old record could go at next summer's World Championships if everything goes well for her over the next few months. It will be fascinating to follow her progress over the winter and see how she shapes up at the traditional Melbourne World Challenge series meeting in early April. One thing is certain - she will never be in a better position to attack the World Record and 2013 could go down as a very special year for Pearson. 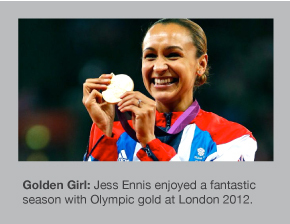 The 2012 Olympic Heptathlon champion, Jess Ennis, finished 2nd in the BBC Sports Personality of the Year awards, which took place at London's ExCeL this evening. A total of 12 contenders were shortlisted for the annual awards and 11 of these achieved success at either the London Olympics or Paralympics. As expected, Bradley Wiggins was triumphant in his quest to become the second consecutive cyslist to lift the award after Mark Cavendish won last year, but there was joy for Jess Ennis, who won Olympic gold this summer in stunning fashion with a British and Commonwealth Record points total of 6955. This latest accolade adds to other recent awards including 'Sportswoman of the Year' by the Sports Journalists' Association and also by the Sunday Times. 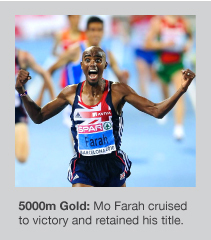 Sadly Mo Farah, the double Olympic champion from London 2012 (over 5000m and 10,000m) failed to finish among the top three of the prestigious awards, the results of which were decided by a telephone vote from the British public, with over 1.5 million votes cast. Paralympian David Weir, who achieved the distinction of winning four golds in London, was also out of the top positions. Italian Andrea Lalli domianted the men's race from start to finish to win the the SPAR European Cross Country Championships in Budapest, Hungary. He even had the luxury of sizeable lead which meant he could celebrate in style by collecting his nation's flag and carrying it over the line in jubilation. The 25-year-old, who has previously won both the Junior and U23 titles at the championships, became the first the win all three races since its inauguration back in 1994. Lalli's time of 30:01 for the 9.9km distance was 10 seconds ahead of Hassan Chahdi of France, while Daniele Meucci made it two Italians in the top three with his third place finish (30:13). There were three Spaniards and three Britons in the top 11. 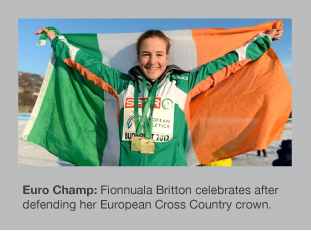 In a close finish, Fionnuala Britton defended her crown won at last year's event with an impressive display to hold off Portugal's Dulce Felix and Adrienne Herzog of the Netherlands. In the end, just three seconds separated all three athletes over 8.05km as Britton secured victory in 27:45. The men's U23 title, which was run over 8.05km, went to Henrik Ingebrigtsen (Norway) in a time of 24:30, while there was success for the British team in the women's race as Jess Coulson struck gold in 20:40 (6.03km). Junior victories were achieved by Szymon Kulka (Poland) and Amela Terzic (Serbia), who was a comfortable winner in her race. 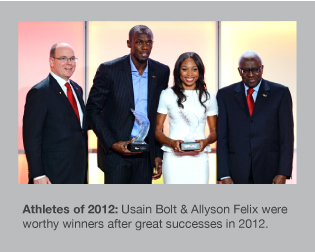 After both enjoying superb seasons, Usain Bolt and Allyson were crowned the 2012 Male and Female World Athletes of the Year. 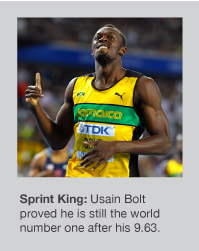 Whilst it is the fourth time Bolt has scooped the prestigious accolade, Felix became a first-time winner. 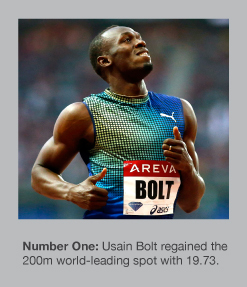 Bolt's season included three golds at the London 2012 Olympics - the 100m (9.63), 200m (19.32) and the 4x100m, in which he ran the anchor leg of Jamaica's quartet, which set new World Record figures of 36.84. Not to be outdone at London, Felix also took home three golds (becoming the first woman since 1988 to achieve this feat at a single Olympic Games) in the 200m and both relays, including the bonus of being part of a new World Record in the 4x100m (40.82). Her 21.69 victory at the US Olympic Trials made her the fourth fastest woman in history. 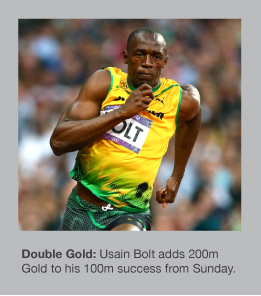 At 26 and 27 respectively, Bolt and Felix arguably have another 2-3 seasons at their peak of their powers and can look forward to the 2013 World Athletics Championships in Moscow confident of further success. 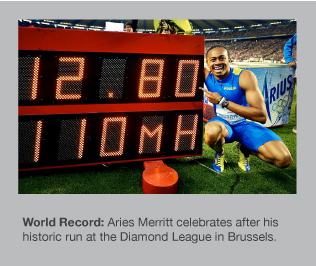 The 2012 Samsung Diamond League series came to a dramatic conclusion this evening in the Belgian capital as Aries Merritt stunned the world of athletics with a new World Record of 12.80 (+0.3m/s) in Brussels. In front of a 50,000-capacity crowd, a technically perfect race saw the American take 0.07secs off the previous mark, which had been held by Cuban Dayron Robles since 12th June 2008. Merritt looked supreme in his 8th sub-13 clocking of the yea to cap a phenomenal season during which he has won Olympic gold at the London Olympics. Behind him, Jason Richardson took 2nd in another impressive run of 13.05. Yohan Blake was dominant in the 200m (19.54, 0.0m/s) while Usain Bolt (9.86, +0.3m/s) took the honours over 100m as both Jamaicans finished their respective seasons in style. The home crowd went crazy as the Borlees twins battled it out in the 400m - Kevin winning in 44.75 ahead of brother Jonathan, who ran 45.02. In the field, Russian Aleksandr Menkov managed a PB of 8.29m (-0.5m/s) to take victory and also scoop the overall Diamond League crown in the Long Jump and Silke Spiegelburg impressed once again with 4.75m in the Pole Vault to also claim Diamond League success. Half of the Diamond League events were decided at the penultimate event of the series in Zurich as the world's best athletes took part in wet and miserable conditions in the picturesque Swiss city. Usain Bolt looked supremely comfortable as he ran a meeting record of 19.66 (0.0m/s) to win the 200m, although his Jamaican compatriot Nickel Ashmeade (2nd, 19.85 PB) went away with the overall Diamond League series title with a total of 15pts. In a non-Diamond League race, Yohan Blake again shows why he's hot on the heels of Bolt with a commanding 9.76 (+1.4m/s) 100m victory, which also broke the previous meeting record. Tyson Gay was disqualified for a blatant false start, which robbed the capacity crowd of an eagerly-anticipated clash. 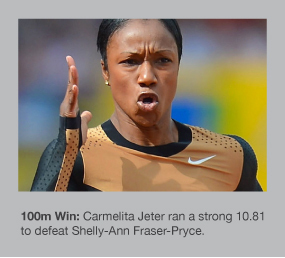 In the women's 100m, Shelly-Ann Fraser-Pryce got back to winning ways with a 10.83 (-0.4m/s) run to leave Carmelita Jeter (10.97) trailing in her wake. The shock of the evening came in the men's 800m, where hot favourite David Rudisha was beaten by Mohammed Aman, who set a new Ethiopian national record with a 1:42.53 clocking. Aman passed the Olympic champion and World Record holder with 100m to go and finished strongly to take a memorable win, which also gave him the overall Diamond League crown. The 100m Hurdles went to Dawn Harper in a time of 12.59, as she beat Queen Harrison (12.68) and Kellie Wells (12.69) to scoop the Diamond League race. The field events were largely affected by the poor conditions with performances slightly below par with the exception of the women's Long Jump, where Yelena Sokolova went out to 6.92m (+0.5m/s) to secure Diamond League victory, and the men's Javelin, which saw another great showing from Tero Pitkamaki, who managed 85.27m in the final round to overhaul fellow Finnish thrower Antti Ruuskanen (83.36m). The final Diamond League meeting of 2012 takes place in Brussels on Friday 7th September, where the remaining series titles will be decided. It promises to be an incredible evening with a host of Olympic champion descending on the Belgian capital for one of the best-attended and most atmospheric meetings on the international circuit. Amongst a host of high quality performances in the 12th event of the Diamond League series in Birmingham, US athletes Aries Merritt and Carmelita Jeter shone as they both set meeting records. Merritt has been running under 13secs for the 100m Hurdles for fun over the summer and he demonstrated his consistency with a 12.95 clocking against a -0.9m/s headwind to get the better of compatriot Jason Richardson, who was rewarded with a PB-equalling time of 12.98. In the women's 100m, Carmelita Jeter showed great strength to hold off the double Olympic champion Shelly-Ann Fraser-Pryce as both went well under 11secs. Jeter's 10.81 was her equal 2nd fastest times of 2012 and only 0.03secs off her season's best performance, while Fraser-Pryce had to settle for 10.90. Robbie Grabarz won the High Jump with another decent performance - this time he cleared 2.32m to defeat a world-class field including Ivan Ukhov and the winner from Lausanne, Moutaz Essa Barshim. There was no such success for Britain's Olympic Long Jump champion, Greg Rutherford, who only managed 7.88m for 3rd place. Aleksandr Menkov showed some look late-season form with his winning jump of 8.18m. Elsewhere in the field, there were expected victories for Valerie Adams in the Shot Put (20.52m), Barbora Spotakova in the Javelin (66.08m, another meeting record) and Robert Harting in the Discus, who extended his long unbeaten run with a 66.64m throw - his only valid effort. Tyson Gay made a rare 200m outing and looked good for 150m before fading towards the end as Nickel Ashmeade surged past to win in 20.12, ahead of Gay's 20.21. 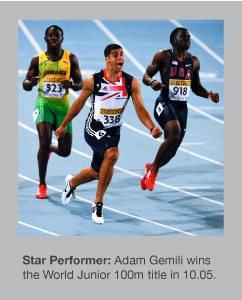 British teenage sensation Adam Gemili improved his PB back in 6th with 20.53. The Women's 400m saw Christine Ohuruogu lose out to Rosemarie Whyte (50.67 to 50.20) as she couldn't use her trademark finish to pass the Jamaican in the closing stages. Another Briton, Perri Shakes-Drayton had the same outcome over 400m Hurdles, with 2nd place (54.08) behind a meeting record of 53.78 for Kaliese Spencer. The Diamond League moves on to Zurich (Thursday 30th August) for the penultimate event in the 2012 series and the first of two 'Finals' where overall Diamond League positions are determined in half of the events before the season concludes at Brussels on Friday 7th September. On a perfect night for fast times, Yohan Blake proved he's a genuine threat to Usain Bolt over 100m by posting the equal second-fastest time in history with a 9.69 clocking in Lausanne, Switzerland at the Diamond League meeting. Into a marginal headwind of -0.1m/s, the Jamaican started strongly then blasted away from the high-quality field to record his huge new PB and make him only the third man ever to run under 9.70. Tyson Gay, who has also run 9.69 in the past, finished 2nd (9.83) and Nesta Carter came 3rd with 9.95 (=SB). Further back, Jimmy Vicaut set a PB with 10.02 for 5th. One of the greatest High Jump competitions in history was witnessed by the packed crowds as Moutaz Essa Barshim cleared a sensational 2.39m to elevate him to equal 8th on the all-time lists and improve his PB and national record by 5cm. Ivan Ukhov took 2nd with 2.37m, while Robbie Grabarz equalled the British record also going over 2.37m. It was only the third time in history (indoors or out) that three different men have cleared 2.37m or more in the same competition. 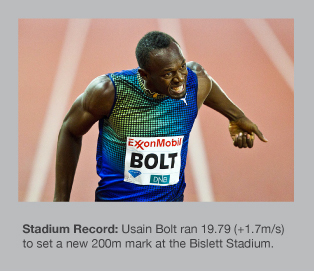 Usain Bolt took victory in the 200m and set a new meeting record of 19.58 (+1.4m/s). There was a national record for Churandy Martina of the Netherlands, who ran 19.85 and Nickel Ashmeade of Jamaica made it three men under 20secs with his 19.94 (=SB). It was business as usual for Kirani James, who won the 400m easily in 44.37. Carmelita Jeter defeated Shelly-Ann Fraser-Pryce by just 0.001 as both were given 10.86 (-0.1m/s) after a titanic battle over the final 30m. Kelly-Ann Baptiste (10.93) and Veronica Campbell-Brown (10.99) also dipped under 11secs. The chance of a potential World Record in the 110m Hurdles failed to materialise as Olympic Champion Aries Merritt false-started and was disqualified to leave the way clear for Jason Richardson to take the win in 13.08 (-0.6m/s). In the field, Valerie Adams was supreme once again in the Shot Put as she set a meeting record of 20.95m in the fnal round, while another Olympic Champion, Renaud Lavillenie also won (on countback) after a best Pole Vauly clearance of 5.80m. The first Samsung Diamond League event following the Olympics was held in the Swedish capital, Stockholm and attracted a number of newly-crowned champions from London. In fact, the first three events of the evening's action were all won by gold medallsits from the Olympics. Sandra Perkovic threw a meeting record of 68.77m in the final round of the Discus to take victory, while the Women's Shot Put also went to the formbook as Valerie Adams dominated with all four of her valid efforts going beyond 20m with a best of 20.26m in the 2nd round. Triple Jump champ Christian Taylor managed just 17.11m (70cm below his winning adistance from London) but still took the honours ahead of Sheryf El Sheryf, who jumped a season's best of 17.04m. Will Claye finished back in 4th with a disappointing 16.88m. Tomasz Majewski could not quite follow up his London triumph as his best of 21.01m was no match for Reese Hoffa, who won the Shot Put with 21.24m. The Women's Pole Vault went to Yarisley Silva - the Cuban looked superb clearing 4.70m first time to defeat Silke Spiegleburg and Fabiana Murer (both 4.55m). Olympic champ Jen Suhr did not clear her opening height of 4.55m. Another American who won in London, Brittney Reese, experienced a disappointing evening as she only managed 6.23m in the Long Jump. Yelena Sokolova took victory with 6.82m. Olympic champ Felix Sanchez was defeated by silver medallist Michael Tinsley, as the US athlete won the 400m Hurdles in 48.50. One London winner who had no problems in their event was High Jump champion Anna Chicherova, who had no failures on her way to 2.00m, which proved enough for a maximum 4 points in the Diamond League race. Maryam Jamal beat a high-quality 1500m field with a devastating last 100m to win in a season's best of time of 4:01.19. The Men's Javelin saw Tero Pitkamaki launch a huge winning throw of 86.98m to smash his best effort of the year - he finished over 3m ahead of Vitezslav Vesely. Yuliya Zaripova set a World-leading 9:05.02 to win the 3000m Steeplechase and also set a new Meeting Record. Leading for the latter stages of the race, Zaripova briefly threatened Gulnara Galkina's World Record mark but faded in the final lap. In the Men's 3000m, winner Isiah Koech ran a PB of 7:30.43 as Kenyan athletes took the first five positions. 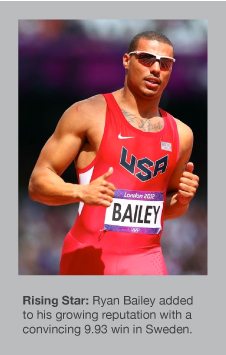 A weakened 100m field without Bolt, Blake, Powell, Gatlin or Gay still managed to produce a fast time as Ryan Bailey clocked 9.93 (+0.7m/s) to win by a clear margin of over 1m. Dawn Harper's 12.65 gave her victory over 100m Hurdles in the absence of Olympic champion Sally Pearson, as Kellie Wells had to settle for 2nd place in 12.76. The evening's final two races were worth waiting for - first, Sanya Richards-Ross dipped under 50 seconds as she won the 400m in 49.89, while World Champion Amantle Montsho, the Diamond League leader, pushed her all the way, clocking 50.03. Christine Ohuruogu was far from her best back in 3rd with 50.77. A perfect-timed surge from Mohammed Aman was instrumental in his 800m success (1:43.56) and Olympic 1500m champion Taoufik Makhloufi will also go home happy after a PB of 1:43.71 gave him 2nd behind the Ethiopian. The Diamond League moves on to Lausanne next week, when the 11th event in the 2012 series takes place on Thursday 23rd August. Usain Bolt collected his third gold medal of the 2012 Olympic Games in London after anchoring the Jamaican 4x100m relay team to a sensational World Record mark of 36.84, taking exactly 0.2secs off the previous figure, that was also held by Jamaica. The quartet of Nesta Carter, Michael Frater, Yohan Blake and Usain Bolt will go down in history as the first team to break the 37-second barrier. The US team equalled the former record of 37.04 in taking silver, while Trinidad & Tobago secured the bronze. In fact, it was a night to remember for 'T & T' as they celebrated a gold medal in the Men's Javelin, thanks to Keshorn Walcott, who set a new National Record of 84.58m to defeat a high calibre field including double Olympic champion Andreas Thorkildsen, who could only finish 6th with 82.63m. 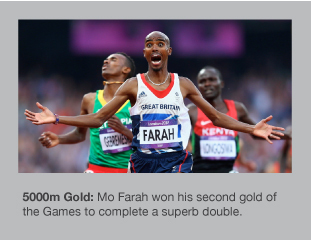 An electric atmosphere was instrumental in driving Mo Farah to his second gold of the Games - this time in the 5000m. After a slow, tactical battle he surged clear in the final lap to the delight of his home crowd and took a memorable victory in 13:41.66. World-leader Dejen Gebremeskel took silver as he failed to overhaul Farah in the final stages. Mariya Savinova was the pre-race favourite in the 800m and she duly delivered with a devasting kick to stride away from her rivals and win gold by over a second with a 1:56.19 clocking. The silver went to Caster Semenya, who confirmed her form is back, while Ekaterina Poistogova made it two Russians on the podium as she took bronze in a PB of 1:57.53. Seven of the eight finalists went under 2 minutes. A tense Women's High Jump final was clinched by Anna Chicherova, as she cleared 2.05m at the second attempt. Brigitta Barrett (USA) and Svetlana Shkolina (RUS) both set new lifetime best marks as they went over 2.03m. Chaunte Lowe finished in 6th with a best clearance of 1.97m. The Women's 4x400m relay saw a stunning performance from the US team, who ran the fastest time since 1993 (3:16.87), aided by a phenomenal 47.8 split from Allyson Felix. Russia and Jamaica took the minor medals on a truly incredible night for athletics at teh Olympic Stadium. Six golds were decided on the penultimate day of action in the Olympic Stadium. There was a sense of expectation that the US Women's quartet could get close to the World Record mark of 41.37 and the team of Madison, Felix, Knight and Jeter smashed the mark with a perfect display of baton changing that culminated in a sensational clocking of 40.82. Jamaica had to settle for a National Record of 41.41, while Ukraine took bronze in anoth National Record mark. Renaud Lavillenie left it late to secure gold in the Men's Pole Vault as he cleared an Olympic Record of 5.97m at the final time of asking to deny the two Germans Bjorn Otto and Raphael Holzdeppe, who each managed 5.91m. Steve Lewis competed well for Team GB and finished equal 5th with a best effort of 5.75m. There was controversy in the Women's Hammer as World Record holder Betty Heidler had a 77m+ throw incorrectly measured, which left her momentarily out of the medal positions. In the end she was credited with a 77.13m distance, bumping Wenxiu Zhang down to 4th. Tatyana Lysenko set an Olympic Record of 78.18m to take gold and former World Record holder Anita Wlodarczyk achieved a season's best of 77.60m for silver. An emotional Meseret Defar won 5000m gold in a slow, tactical race (15:04.25), which saw compatriot Tirunesh Dibaba take bronze behind Kenya's Vivian Cheruiyot. Jo Pavey got the better of Julia Bleasdale to win the domestic battle for honours as she finished 7th in what will almost certainly be her last Olympics. There was a Turkish 1-2 in the Women's 1500m as Asli Cakir Alptekin took victory in 4:10.23 and Gamze Bulut produced a strong finish to win silver (4:10.40). The bronze went to Maryam Yusuf Jamal. Morgan Uceny was desperately unlucky to once again fall in a global final, while her US teammate Shannon Rowbury could only manage 6th place. The evening's action came to a climax with the Men's 4x400m Final. The US team were denied victory by a stunning performance from the Bahamas team, who clocked a National Record of 2:56.72. Trinidad & Tobago won a superb bronze, setting another National Record mark (2:59.40) as Deon Lendore held off Martyn Rooney in the last 50m. Some athletics nights stick in the memory forever - this was most definitely one of them. David Rudisha showed his intentions for a true-run 800m final as he went through the bell in just 49.28 and clocked 1:14.30 for 600m on his way to a remarkable World Record of 1:40.91 and Olympic gold. Behind Rudisha, teenager Nijel Amos set a World Junior Record with his 1:41.73 to also go equal third on the all-time 800m lists. Bronze medallist Timothy Kitum's 1:42.53 was a major step forward for the young Kenyan. Indeed, seven of the eight finalists set lifetime bests, highlighted by the fact that Team GB's Andrew Osagie finished last but smashed his PB with an impressive run of 1:43.77. Usain Bolt and Yohan Blake were also going to be one and two in the 200m final but the order was not easy to predict - Bolt settled that argument with a resounding 19.32 run and even eased off as he approached the line to celebrate. Blake's reward was a 19.44 season's best, while Warren Weir broke his PB with 19.84 to complete a Jamaican clean sweep. The Men's Triple Jump final saw Christian Taylor strike gold with his 4th round effort of 17.81m. His US compatriot Will Claye took silver after a 17.62m jump in the same round was enough to hold off the veteran Italian Fabrizio Donato, who rolled back the years with a superb series to win bronze (17.48m). Barbora Spotakova threw a season's best of 69.55m at exactly the right moment to win Javelin gold. In fact, all of her four valid efforts were long enough to defeat her rivals in the end. Nearly five metres back in silver medal position was Christina Obergfoll (65.13m), who was joined on the podium by her teammate Linda Stahl, who managed a season's best of 64.91m to claim bronze. 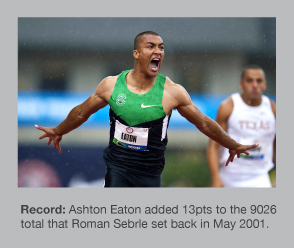 The Decathlon was won by the new World Record holder Ashton Eaton and his overall points total of 8869 was just 24pts shy of Roman Sebrle's Olympic Record mark. Trey Hardee made it an American 1-2 with his 8671pts and Leonel Suarez, largely aided by a mammoth 76.94m Javelin effort in the event's penultimate discipline (996pts) took bronze. Damian Warner was teh only competitor to register a PB as he scored 8442 to finish 5th for Canada. On Day 2, the British team celebrated an incredible three golds in one evening and the United States team repeated this feat tonight with golds for Brittnery Reese in the Long Jump, Aries Merritt (110m Hurdles) and Allyson Felix (200m). Reese only managed two valids jumps during the Long Jump final - one of which was 7.12m and enough to secure gold ahead of Russian Elena Sokolova (7.07m). Reese's compatriot, Janay DeLoach narrowly took bronze with her best effort of 6.89m, just 1cm further than Ineta Radevica back in 4th place. One of the best fields ever assembled in the Women's 200m guaranteed a memorable race and Allyson Felix got the better of her rivals with a resounding 21.88 (-0.2m/s) to give her a first Olympic gold. Shelly-Ann Fraser-Pryce backed up her 100m victory with silver in a PB of 22.09 and Carmelita Jeter ran a strong race from lane 9 to take bronze in 22.14. After a fantastic season, Aries Merritt was the strong favourite to add Olympic gold to his growing reputation and he duly delivered, winning in 12.92 and marginally improving his World-leading mark of 12.93 he has run on no less than three occasions this season. Jason Richardon had to settle for silver in 13.04, while Dayron Robles didn't finish, leaving the way clear for Hansle Parchment to set a Jamaican record of 13.12 and win the bronze. Team GB's Lawrence Clarke must be delighted with his 4th place in his home Olympic final. The only final not won by a member of the US team was the Women's 400m Hurdles, however it was incredibly tight in the end. Natalya Antyukh just held off Lashinda Demus to take gold in a new PB of 52.70 and Demus was rewarded with a season's best of 52.77. Zuzana Hejnova of the Czech Republic was overjoyed with her bronze medal (53.38). In the Javelin qualifying, Vitezslav Vesely threw a new PB and World-leading 88.34m to set up a showdown with double Olympic Champion Andreas Thorkildsen, who was the furthest qualifier in his group with 84.47m. World Record holder Ashton Eaton built up a strong lead in the Decathlon after his 100m (10.35), Long Jump (8.03m), Shot Put (14.66m), High Jump (2.05m) and 400m (46.90) gave him a first-day total of 4661pts. Trey Hardee goes into the second day with a 220pt deficit to make up. Damian Warner sits third, 55pts behind Hardee. Four gold medals were decided on the 'middle' day of action in the Olympic Stadium and Sally Pearson stole the limelight with her superb 12.35 (-0.2m/s) run to win the 100m Hurdles ahead of Dawn Harper, who set a PB of 12.37 and Kellie Wells, who also managed a PB with her time of 12.48 to ensure two Americans made the medal rostrum. Robert Harting won a very tight Discus competition that saw the top three separated by just 24cm. Harting's best throw of 68.27m came in the 5th round and was enough to defeat Ehsan Hadadi of Iran (68.18m) and Estonia's Gerd Kanter (68.03m). Veteran Virgilijus Alekna just missed out with the 40-year-old Lithuanian throwing 67.38m for 4th place. The Men's High Jump Final was dominated by one man as Ivan Ukhov won by two clear heights with a best of 2.38m. The Russian was on top form to beat Erik Kynard (2.33m), while three jumpers tied for bronze with Robbie Grabarz, Derek Drouin and Mutaz Essa Barshim all over 2.29m with no failures. Taoufik Makhloufi won gold in the 1500m for Algeria (3:34.08) after the race started out slow and ended up with a sub-53 final lap. Leonal Manzano finished strongly to take silver and Abdalaati Iguider just held on to bronze as Matt Centrowitz almost passed him on the line. Kirani James provided the undoubted highlight in the Olympic Stadium this evening as the 19-year-old from Grenada became the first non-American to go under 44 seconds for the 400m as he won gold in a stunning 43.94 to go 9th on the all-time lists. Luguelin Santos - himself only 18, won silver in 44.46, while Lalonde Gordon managed a PB of 44.52 for bronze and a Caribbean clean sweep of the medals. World-leader Jennifer Suhr struck gold in the Pole Vault with 4.75m to win on countbak from Yarisley Silva, who equalled her Cuban National Record for silver and Yelena Isinbayeva had to settle for bronze with 4.70m her best clearance. Elsewhere in the field, Nadzeya Ostapchuk got the better of her great rival, Valerie Adams, with a best of 21.36m. Adams took silver with 20.70m and a huge new personal best of 20.48m won bronze for Russia's Evgenlia Kolodko. There was no medal for Team GB's Dai Greene, who came 4th in the 400m Hurdles Final in a time of 48.24. Felix Sanchez won his 2nd Olympic gold (he first won in 2004), and Michael Tinsley made a major breakthrough with 47.91 (PB) for silver. Javier Culson, many people's pre-race favourite came 3rd with a time of 48.10. In the evening's other final, Russia's Yuliya Zaripova set a PB of 9:06.72 to defeat Habiba Ghribi of Tunisia (9:08.37 NR). All of the world watched as Usain Bolt proved any doubters wrong with a superb display of sprinting under pressure to win Olympic gold and retain his title from 2008. His time of 9.63 was the second fastest in history and only the 4th time anybody has run under 9.70. Having got a great start, Bolt powered away to win by over a metre, defeating his compatriot Yohan Blake, who equalled his PB of 9.75 for silver. Justin Gatlin took bronze in a 9.79 PB, while Tyson Gay was distraught to miss out on a medal by 0.01secs with 9.80. Seven men went under the magical 10-second barrier. Olga Rypakova won the Triple Jump with a season's best of 14.98 and Caterine Ibarguen again showed her consistency claiming silver with a last-round 14.80m jump. Olha Saladuha won the bronze after her best effort of 14.79m also came in the final round. The Men's Hammer went to Krisztian Pars, who was the only man to go over 80m with his 80.59m. In a dramatic Women's 400m, four of the finalists ran under 50 seconds and Christine Ohuruogu again brought her best form into a major championships, taking silver in a season's best of 49.70, however Sanya Richards-Ross was simply too good, winning in 49.55. It was business as usual for Ezekiel Kemboi in the 3000m Steeplechase, who entertained the crowd with his customary dance after becoming Olympic champion in a time of 8:18.56. On the most remarkable night for British athletics in history, Jessica Ennis, Greg Rutherford and Mo Farah all struck gold to send the home fans into raptures. Ennis rounded off the Heptathlon competition with a 6.48m Long Jump (1001pts), 47.49m Javelin (812pts) and 2:08.65 800m clocking (984pts) to give her a total of 6955pts - a new British Record. Her winning margin was a huge 306pts with Lilli Schwarzkopf getting silver (6649) and Tatyana Chernova close behind with 6628 for bronze. Rutherford took the Long Jump lead in round two with 8.21m before extending it with 8.31m two rounds later. The battle for minor medals was extremely tight but Mitchell Watt did enough to take silver (8.16m) and Will Claye won bronze for the US team with a best effort of 8.12m. 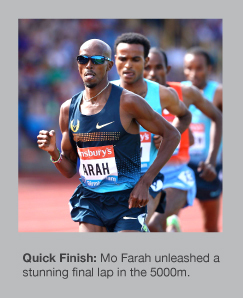 The golden trio was completed by Farah, who used his electric finish to maximum effect to win in 27:30.42. His training partner, Galen Rupp, was ecstatic to finish in second place and take back a silver medal to the United States. Tariku Bekele secured a rare victory over his more illustrious brother, Kenenisa, to win the bronze. A National Record for Sandra Perkovic of 69.11m gave the Croatian Olympic gold, while Darya Pishchalnikova was over a metre and a half back in 2nd place. The day's other final took place on the streets of London and Ding Chen set an Olympic Record to take gold in the 20k Race Walk (1:18.46). Tomasz Majewski retained his Olympic crown from Beijing in a closely fought battle with young German David Storl. His 21.89m (SB) took victory by just 3cm, with Storl - the 2011 World Champion, managing an impressive 21.86m for silver. Bronze went to Reese Hoffa, who narrowly edged out fellow American Christian Cantwell (21.23m to 21.19m). As was expected, the East African nations dominated the Women's 10000m and Ethiopia took the honours courtesy of Tirunesh Dibaba's 30:20.75 winning time. Kenya had to be satisifed with the minor medals as Sally Kipyego and Vivian Cheruiyot won silver and bronze respectively. Jessica Ennis started the Hepthalon well, taking a lead into Day 2 aided by a staggering 12.54 run over 100m Hurdles for a World Best (in a Hepthathlon) and a 22.83 200m clocking. 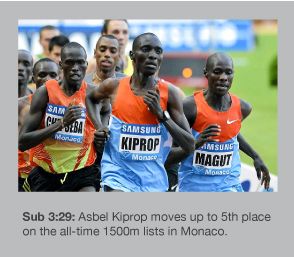 On a warm, still summer's evening in Monaco, Asbel Kiprop elevated himself to 5th on the all-time 1500m lists, running the quickest time since 2004 with his 3:28.88 clocking. Kiprop was not the only athlete to go under the magical 3:30 barrier as compatriot Nixon Chepseba ran 3:29.77 for a new PB. Nick Willis almost became the first athlete from Oceania to break 3:30 in 3rd but the New Zealander had to be content with a 3:30.35 area record. There were notable runs from two young Kenyan on the track as Abraham Rotich won a competitive 800m with 1:43.13 (national junior record) and 17-year-old Conselus Kipruto timed his finish to perfection to beat Paul Kipsiele Koech in 8:03.49 to take more then 2 seconds off his lifetime best. 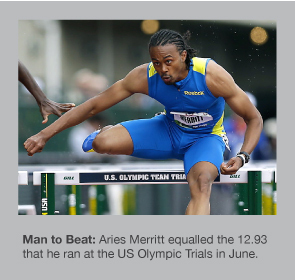 Quite remarkably, Aries Merritt managed his 3rd time of 12.93 to equal the World leading mark that he originally set at the US Trials in June. In a high quality race, Jason Richardson ran 13.07 and Russian Sergey Shubenkov matched his national record with 13.09. Jonathan Borlee got the better of reigning World Champion Kirani James over 400m winning by just 0.02sec in 44.74. Yelena Isinbayeva did not even clear her opening height of 4.70m in the Pole Vault as Silke Spiegelburg went on to smash the German record with her 4.82m effort to defeat a high calibre field including Fabiana Murer, who only scaled 4.54m. Elsewhere in the field, Caterine Ibarguen produced a consistent series to win the Triple Jump (14.85m) and Jesse Williams won the High Jump on countback from Briton Robbie Grabarz with both men clearing an impressive 2.33m. The US 4x100m Relay team warmed up for London 2012 with a stunning display and Trell Kimmons, Justin Gatlin, Tyson Gay and Ryan Bailey were rewarded with a World-leading time of 37.61. Aries Merritt established himself as one of the men to beat at London 2012 after another sub-13 clocking at Crystal Palace, London in the eighth Diamond League meeting of 2012. The sprint hurdler equalled the 12.93 he set when winning the US Trials in Eugene and confirmed he is in top form ahead of the Olympic Games in less than a month. Another world-leading mark was equalled by Javier Culson (47.78) in winning the 400m Hurdles, once again getting the better of Dai Greene. Jack Green set a big new PB of 48.60 back in 4th. There was a British record for Goldie Sayers after her opening throw of 66.17m was enough to win the Javelin and give her a timely boost before she aims to win gold at the Olympic Stadium. The performance was even more impressive given the weather conditions, which were largely cold, wet and miserable. The Women's 400m Hurdles provided more for the British crowd to cheer as Perri Shakes-Drayton smashed her lifetime best with 53.77 to win by almost one second. Chris Tomlinson's season's best of 8.26m was good enough for second behind Mitchell Watt, who jumped 8.28m. The two days of action threw up its fair share of surprises as Sally Pearson lost in the 100m Hurdles for the first time in 2012 as Kellie Wells ran 12.57 to pip the Australian World Champion by 0.02sec. Liu Xiang withdrew from the 110m Hurdles final after qualifying with ease, citing a sore back as the problem. The Men's 5000m was about one man as Mo Farah duly won in 13:06.04 and used his strong kick to bring him clear of Collis Birmingham, who was rewarded with a PB of 13:09.57. Tyson Gay managed 10.03 into a -1.2m/s headwind to secure victory over 100m and Christophe Lemaitre caught the eye with a swift 19.91 (SB) over 200m, with Churandy Martina also under 20 seconds with 19.95. Christine Ohuruogu delighted the home fans with the meeting's last event, defeating the consistent Amantle Montsho with an inspired finish that took her past the World Champ with around 10m to go. Her time of 50.42 was a season's best. The Diamond League now moves on to Monaco for the ninth event in the 2012 series, which will take place on Friday 20th July - the final chance for athletes to test themselves before the Olympic Games begins. British sensation Adam Gemili confirmed his position as the hottest young sprint prospect around by winning the 100m in Barcelona at the World Junior Championships. His time of 10.05 (+0.1m/s) was not only enough for gold but broke the Championship record (previously held by Darrel Brown at 10.09) and also set a new lifetime best performance. Gemili dominated the race from the halfway mark and ran away from the field to secure a comfortable victory. He can now go to his home Olympic Games in London full of confidence and with nothing to lose having already achieved his objective for the season. The Women's 100m went to Anthonique Strachan of the Bahamas, who clocked an excellent 11.20 to win the gold, while Jacko Gill managed a Championship record of 22.20m to duly win the Shot Put title however Krzysztof Brozowski pushed him in the early stages of the competition, bettering Gill's first round effort and momentarily holding a new Championship best mark of 21.78m until the New Zealand star responded to regain the lead. Gunnar Nixon won Decathlon gold (8018pts) after a heroic 1500m run that saw him overhaul Jake Stein for victory. It was a photo-finish in the Women's 5000m as Buze Diriba (15:32.94) prevailed over her Ethiopian teammate Ruti Aga by just 0.01sec. In the field, Sergey Morgunov lived up to his billing as pre-event favourite by winning gold with a best effort of 8.09m in the first round, and Sofi Flinck produced a stunning final round throw in the Javelin to smash her PB and record a distance of 61.40m to give Sweden the gold. The reigning World Athletes of the Year, Sally Pearson and David Rudisha, stole the show in the French capital this evening as Paris was treated to a very special Diamond League meeting in the Stade de France. Rudisha ran the seventh fastest 800m of all-time with his 1:41.54 clocking and maintains that he will break his own World Record of 1.41:01 when the conditions are more favourable. Going through the bell in 49.3, he looked intent on a super-fast time but the final 100m split of 13.9 cost Rudisha a famous record. To emphasise the superiority held over his rivals, Alfred Kirwa Yego finished 2nd in 1:45.62 - over four seconds down. The 100m Hurdles has become owned by Pearson in recent years and she dominated once again, winning in 12.40 - her 3rd fastest time ever and only 0.19sec off Yordanka Donkova's World Record mark that has stood since 1988. Again, with warmer, drier weather there is a decent chance that Pearson can break this mark and elevate herself to one of the all-timem greats. Second place went to Ginnie Crawford with an impressive season's best time of 12.59. A total of six men went under 12:50 in arguably the high quality 5000m race in history. Dejen Gebremeskel held off 18-year-old Hagos Gebrhiwet for victory in 12:46.81 (fifth fastest ever), while Gebrhiwet had to be content with a World Junior Record of 12:47.53. Kenenisa Bekele's 12:55.79 was only good enough for 9th position). In a night for fast middle and long distance times, Mariem Selsouli smashed the Moroccan record after running 3:56.15 in the 1500m and Paul Kipsiele Koech almost dipped under 8 minutes in the 3000m Steeplechase, winning in 8:00.57. Elsewhere, Dai Greene just missed the British record over 400m Hurdles as he pushed Javier Culson all the way. Culson's 47.78 was a world-leading time and Greene set a PB of 47.84 for 2nd. 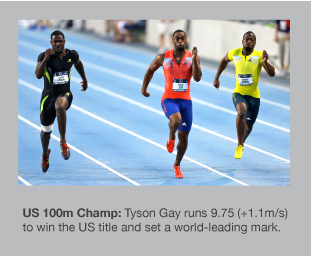 The Men's 100m went to Tyson Gay (9.99) as a late surge saw him power past fellow US sprinter Justin Gatlin. Amantle Montsho continued her strong season with 49.77 to win the 400m. The chilly, damp evening meant performances in the field were slightly below-par in the main although Leevan Sands looked strong with his 17.23m season's best effort to win the Triple Jump. Allyson Felix ran a sensational 21.69 (+1.0m/s) to win the 200m in Eugene at the US Trials and send a message to her rivals ahead of the London 2012 Olympics in a month's time. This time moves her up to 4th on the all-time lists behind Florence Griffith-Joyner, Marion Jones and Merlene Ottey. Carmelita Jeter came 2nd (22.11 PB), while Sanya Richards-Ross finished 3rd in 22.22. This formidable trio will now head to London for the Games. 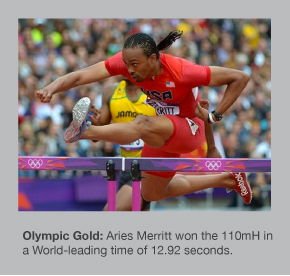 Elsewhere in Eugene, Aries Merritt ran a world-leading 12.93 (+1.2m/s) as he took victory over 110m Hurdles and set a world-leading mark in the process. Jason Richardson had to be content with a 12.98 clocking and a new PB. The third spot on the US team went to an ecstatic Jeff Porter, who ran his second PB of the trials (13.08). Chaunte Lowe produced a perfect card in the High Jump up to and including 2.01m to win on countback from Brigetta Barrett, while Christian Taylor (17.63m) narrowly defeated Will Claye (17.55m) in the Triple Jump. Both will be expecting to leave London with a medal when the world's best jumpers will all be present. A total of 12 finals took place on the final day of action in Helsinki including some memorable performances. Asli Cakir-Alptekin took gold in the Womens' 1500m (4:05.31) to get the ball rolling as the Turkish team enjoyed a 1-2 (Gamze Bulut took silver with 4:06.04). The Men's 110m Hurdles semis provided two exceptional runs by Sergey Shubenkov (13.09, -1.1m/s) and Garfield Darien (13.15, -0.3m/s), before Shubenkov went on to win the final in 13.16 (+0.5m/s). Poland's Anita Wlodarczyk threw 74.29m in the Hammer for an expected victory over Martina Hrasnova (73.34m). In one of the best head-to-heads of the week, Renaud Lavillenie prevailed over an inspired Bjorn as he cleared a world-leading 5.97m at the first attempt for gold, while Otto settled for a PB of 5.92m. The German Women's 4x100m team were too strong for their rivals (42.51 EL) although they were helped by Ukraine failing to get round. Holland set a national record for silver (42.80) and set another new mark in the Men's 4x100m where they went one better and won gold in 38.34. Germany took silver, France went away with bronze and the British team endured another dropped baton as they went out at the first changeover. Dulce Felix was an excellent winner of the Women's 10,000m and Jo Pavey picked up a popular silver medal after many near misses in the past. 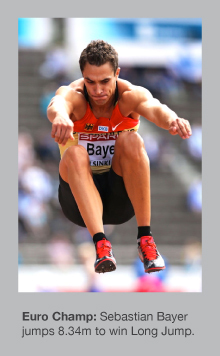 The Men's Long Jump was won by Sebastian Bayer with a best effort of 8.34m - just 1cm off the world's best jump in 2012. There was joy for Croatian Sandra Perkovic who got the better Nadine Muller in the Discus to win by over 2m (67.62m vs 65.41m). Norway secured a slightly surprise win in the 1500m as Henrik Ingebrigtsen became European Champion in a slow, tactical and physical race that saw three different athletes fall, including the local athlete Niclas Sandells. The 4x400m relays provided a fitting climax to the five-day championships with Ukraine taking gold in the women's event (3:25.07) and Kevin Borlee running a storming final leg to anchor the Belgian team to glory, overhauling Richard Buck (GB) in the process. Their winning time of 3:01.09 is a European best for 2012. The penultimate day's action from the Olympic Stadium in Helsinki started with the big two in the Women's Discus - Sandra Perkovic and Nadine Muller, qualifiying automatically for the final with 62.01m and 64.49m respectively. Three Germans filled the top six places with Anna Ruh and Julia Fischer looking to get amongst the medals. Great Britain & NI posted the morning's fastest time in the Men's 4x100m relay after running 38.98 for victory in the first semi-final. A very strong French team won the other semi in a slightly slower 39.01. The British women didn't fair so well, getting disqualfied after Hayley Jones ran inside her lane on the third leg. Ukraine looked impressive in setting the quickest time of 42.70. Germany, France and Poland will all be threats in the final. A wide-open Women's 1500m is set for tomorrow after two competitive semi-finals were won by Anna Mishchenko (4:08.95) and Yekaterina Gorbunova (4:11.58). The Men's 1500m races were equally slow and tactical - the fastest qualifier was Andreas Vojta who ran 3:41.24 to win the first semi. 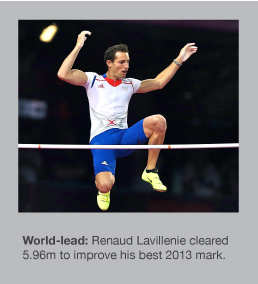 Renaud Lavillenie eased into the Pole Vault final with a huge 5.55m clearance. There will be 13 in the final although Romain Mesnil and Denys Yurchenko went out after no-heighting. 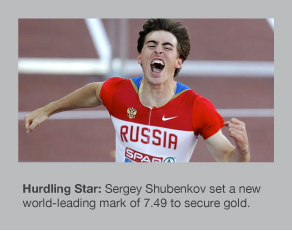 European leader Sergey Shubenkov showed why he's so highly regarded as he sped to a 13.28 clocking (+1.1m/s) and the fastest time over 110m Hurdles by some margin. Garfield Darien ran 13.46 into a strong headwind of -2.0m/s and could push the Russian in the final providing both men qualify safely. Ida Nana Djimou moved closer to Heptathlon gold after she set PB's in both the Long Jump (6.42m, 981pts) and Javelin (55.82m, 973pts) to lead by a huge 162pts going into the 800m later today, where she should secure victory for the French team. The weather turned foul during the evening with surface water in places and heavy rain for much of the session. The Heptathlon 800m saw Jessica Samuelsson run a 2:08.70 season's best but it was all about Ida Nana Djimou, who completed her competition with a 2:17.99 clocking and took gold with a PB total of 6544pts. Lyudmyla Yosypenko took silver (6387pts) and Laura Ikauniece held off her Latvian teammate Aiga Grabuste to take bronze (6335pts, PB) by a narrow 10pt margin. Veteran Fabrizio Donato, now 35 years of age, stunned the watching crowd when he bounded out to 17.63m in the first round (+2.8m/s) and followed it up with a legal 17.53m (+0.8m/s) to record a memorable victory over Sheryf El-Sheryf (17.28m). 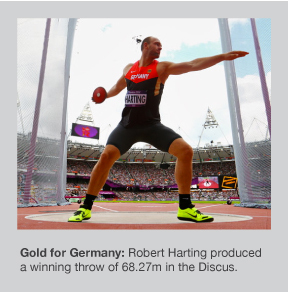 As expected, world leader Robert Harting won the Discus with a best throw of 68.30m in the fourth round. Gerd Kanter took silver with 66.53, just 11cm ahead of Zoltan Kovago. Defending champion Nevin Yanit was the only woman under 13 seconds in the 100m Hurdles semi-finals as she won her race in 12.92. The British Men's 4x400m team won their semi in 3:05.50 to set the second quickest qualifying time behind the Belgian quartet's 3:05.29, which was achieved in the second race. France and Ukraine won their 4x400m semis in the women's event as the British team looked strong in their race with a high quality team display. In difficult conditions for the Pole Vault, Jirina Ptacnikova took gold on countback after clearing 4.60m. The silver went to Martina Strutz, while Greece celebrated a bronze courtesy of Nikolia Kiriakopoulou - both also clearing 4.60m. Elsewhere in the field, Krisztian Pars justified his billing as the likely winner by throwing the Hammer out to 79.72m for the gold. The Women's 3000m Steeplechase was won by Gulcan Mingir (9:32.96), who did just enough to hold off Svitlana Shmidt of Ukraine (9:33.03) for the gold. It was a Ukrainian 1-2 in the Women's 200m final as Mariya Ryemyen won gold in 23.05 ahead of Hrystyna Stuy (23.17). Former Kenyan Polat Kemboi Arikan held off a challenge from Daniele Meucci and Yevgeniy Rybakov to take victory in the 10,000m with a time of 28:22.27. The evening's last two track finals brought gold for Churandy Martina in the 200m (20.42, -0.9m/s) as the Dutch enjoyed a 1-2 (Patrick Van Luijk took silver in 20.87), while Nevin Yanit defended her 100m Hurdles crown with a winning time of 12.81 (-1.4m/s). The first day of a slightly weakened Heptathlon got underway missing many of Europe's star names. Ida Nana Djimou got off to a great start winning the 110m Hurdles in a PB of 13.11 (1108pts) - in fact the top four women all recorded lifetime bests in the first event. In the High Jump, Yekaterina Bolshova sailed over 1.86m to take 1054pts as the three early leaders all managed just 1.77m. The Shot Put saw Lyudmyla Yosypenko achieve a 14.32m PB to throw down the gauntlet to her challengers. Nevin Yanit, the defending 100m Hurdles champion, got her campaign off to a great start running the fastest qualifying time of 12.78. There was just a single automatic qualifier in the Men's Discus - Mario Pestano, who threw 66.27m. A very strong field of 12 progress to the final with Robert Harting the likely favourite for gold. 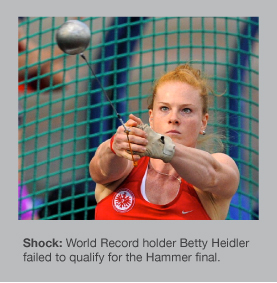 In arguably the biggest shock of this year's championships so far, World Record holder Betty Heidler failed to qualify for the Hammer final after throwing only 65.06m - more then 5m below the automatic mark and over 15m down on her record distance. The qualifiers were headed by Anita Wlodarczyk with 71.38m. Jonathan Borlee moved down from 400m to 200m and recorded the morning's quickest heat time (20.61), while Mariya Ryemyen was fastest in the Women's heats with a time of 22.77. The Men's Long Jump saw Sebastian Bayer produce a stunning qualifying leap of 8.34m in the first round, which was 27cm further than any of his rivals could manage. Lyudmyla Yosypenko managed a solid 24.14 over 200m to take an overnight lead in the Heptathlon with a total of 3785pts. Just 23pts separate 2nd from 5th going into day two. The evening's first final was won by Nadine Kleinert, as she threw three of the competition's four furthest efforts, culminating in a best of 19.18m that was comfortably good enough for gold. Great Britain's Robbie Grabarz won the High Jump on countback from Raivydas Stanys as both men cleared 2.31m. The Men's 3000m Steeplechase provided great drama as Victor Garcia fell at the final barrier to gift victory to Mahiedine Mekhissi-Benabbad (8:33.23), who defended the title he won in 2010. Garcia picked himself up to claim a gutsy bronze. Vira Rebryk set a Ukrainian national record on her way to winning to Javelin with 66.86m, upsetting pre-event favourite Christina Obergfoll, who finished 2nd with a best of 65.12m. The Men's 800m was won by Yuriy Borzakovskiy, as he timed his finish to perfection to win gold in a slow race (1:48.61). In one of the best performances of the week so far, Irina Davydova told gold over 400m Hurdles in a world-leading 53.77 ahead of Denisa Rosolova, who ran a PB of 54.24 for silver. If that was special, Olha Saladuha's superb 14.99m performance to win the Triple Jump was possibly even more impressive. Every one of her four valid jumps would have been enough to win gold. 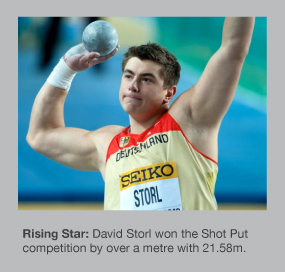 David Storl was the predictable winner of the Shot Put - the young German sensation managing a season's best distance of 21.58m to win by over a metre. The Men's 400m was won in 45.24 by Pavel Maslak for the Czech Republic, while the Women's final went to Sweden's Moa Hjelmer, who set another national record with 51.13 for victory. Yelena Arzhakova ran a fantastic race to take 800m glory in 1:58.51 and a winning margin of over 2 seconds. A storming finish saw Lynsey Sharp rewarded with the silver medal and a PB of 2:00.52. In the evening's other final, Rhys Williams made it three golds for the British men as he cruised to a 49.33 clocking in the 400m Hurdles. Churandy Martina looked good with his 20.63 qualification through to the 200m final although one of the favourites, Greek Likourgos-Stefanos Tasknoas was disqualified after his victory. The Dutch had plenty to celebrate as Dafne Schippers ran a season's best of 22.70 to qualify for the Women's 200m final and put herself in with a real medal shout. Day Two started with the resumption of the Decathlon and the overnight leader Oleksiy Kasyanov lost 9pts to Pascal Behrenbruch as the tall German ran 14.16 in his 100m Hurdles heat to set the fastest time of the morning. Kasyanov had to settle for a clocking of 14.23. Behrenbruch then took another 10pts out of the Ukrainian with his 48.24m effort in the Discus to close the gap. The Pole Vault might prove to be the turning point as Kasyanov could only manage 4.80m (849pts) compared to Behrenbruch's PB of 5.00pm (910pts) - this gave the German a 19pt lead going into the penultimate event of the Decathlon, the Javelin. The main names duly progressed in the Women's Pole Vault with 4.40m proving enough to qualify for Saturday's final. Monika Pyrek was the only real casualty as she bowed out with a best of 4.35m. 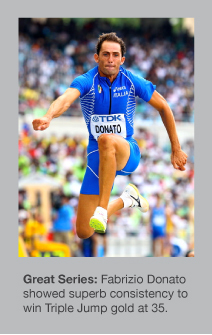 Two men surpassed 17m in Triple Jump qualification as veteran Fabrizio Donato bounded out to 17.17m and Karol Hoffmann of Poland set a PB of 17.09m. One of the favourites in the Women's 400m Hurdles, Angela Morosanu, ran a poorly judged race and faded dramatically in the final 100m to finish last in her semi-final. Anna Yaroshchuck (Ukraine) and Irina Davydova (Russia) won their races in 54.69 and 54.68 respectively in what looks to be a very open discipline. Zuzana Hejnova and Denisa Rosolova are both in with a shout of the medals when the final takes place tomorrow. The Men's 400m Hurdles saw every finalist dip under 50 seconds and Emir Bekric produced a Serbian national record to win his semi (49.37) and set the quickest qualifying time. Rhys Williams (49.63) looked strong once again as he won his semi in comfortable fashion. Nathan Woodward went through as the second fastest loser. Just 7 of the 22 Women who completed their 3000m Steeplechase heats were eliminated and the qualifiers were headed by Turkish athlete Gulcan Mingir. Three Germans made it through to Saturday's final. It was also a good day for the German team in the Women's Shot Put with their three of the top four qualifiers coming from their squad. Nadine Kleinert produced the furhest effort with 18.65m. In the final event of the session, Krisztian Pars was the only thrower to qualify by right for the Hammer final after he went out to 78.09m in the third round. In the end, 72.85m was enough to get through in a disappointing competition. 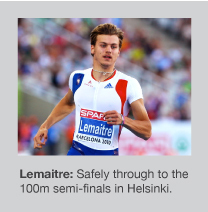 Christophe Lemaitre retained his European 100m crown with a 10.09 run against a gentle headwind of -0.7m/s. It was a 1-2 for France as Jimmy Vicaut took silver in 10.12 while Jaysuma Saidy Ndure ran 10.17 for bronze in a race that only five sprinters finished. The Women's 100m was won by Ivet Lalova in a relatively slow 11.28 (-0.7m/s) - the minor medals going to Olesya Povh and Lina Grincikaite, who both managed times of 11.32. 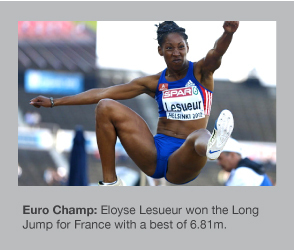 There was more French success in the Women's Long Jump as Eloyse Lesueur took victory with a best effort of 6.81m. Olga Golovkina won gold in a tight 5000m with a time of 15:11.70. Julia Bleasdale smashed her PB by 13 secs but was just run out of the medals in 4th place (15:12.77). An emotional Ruth Beitia won the High Jump for Spain on countback from Tonje Angelsen - both clearing 1.97m. The bronze was shared by three different athletes, who each cleared 1.92m with no failures. European leader in 2012, Vitezslav Vesely, threw 83.72m to win the Javelin ahead of Valeriy Iordan, who added 2.5m to his PB with 83.23m. Sadly Andreas Thorkildsen finished back in fourth place having withdrawn from the competition in the fourth round. Predictably, the Decathlon was won by Pascal Behrenbruch following a strong Javelin and solid performance over 1500m. His total of 8588pts was a PB. Ex-world record holder Roman Sebrle still managed to post a 8000+ total with 8052pts for sixth. In the qualifying competitions, Kseniya Zadorina was quickest over 400m (51.35) and Moa Hjelmer set a Swedish national record of 51.40 as they booked their places in tomorrow's final. The Men's 400m looks extremely open as less than half a second seperates all eight finalists. Pavel Maslak set the fastest semi-final time of 45.66. Yuriy Borzakovskiy looked ominously cool as he did just enough to reach the 800m final (1:46.92) and there will be two Britons in the Women's 800m final after both Jemma Simpson (3rd, 2:01.64) and Lynsey Sharp (2nd, 2:01.88) qualified. There were no sub-2:00 runs from any of the finalists, indicating it could be another open race. The European Athletics Championships got underway this morning in Helsinki, Finland with a number of the continent's top athletes starting their campaigns in the heats and qualifying competitions. In the Women's Long Jump, three athletes managed 6.66m (Renstrom, Lesueur and Mey) to surpass the automatic qualification distance of 6.65m. Just two men qualified by right in the Shot Put as David Storl (20.30m) and Rutger Smith (20.55m) went through to the final in style. Britain's Carl Myerscough just missed out in 14th place overall with a best of 19.30m. Ivet Lalova was the quickest 100m qualifier with an impressive 11.06, while Verena Sailer (11.14) also looked good. The Men's 100m heats were headed by Christophe Lemaitre and Jimmy Vicaut - the only two sprinters under 10.20 (10.14 and 10.18 respectively). There were no surprises in the Women's High Jump as 1.90m was enough to qualify in the end (Adonia Seryiou even made it through with her 1.87m clearance). Olga Saladukha bounded out to 14.77m to top the Triple Jump qualifiers. Three men dipped under 50 seconds in the 400m Hurdles heats and both Rhys Williams (50.40) and Nathan Woodward (50.02) won their heats in commanding fashion. The Men's 400m provided its fair share of disqualifcations as no fewer than seven different men were eliminated for lane infringements, including Richard Buck, who was later reinstated after an appeal (he won his heat in 45.83). Zuzana Hejnova showed her class with a solid 55.24 to win her 400m Hurdles heat and set the session's fastest time. In the Men's 800m, Gareth Warburton lead from gun-to-tape for a 1:45.80 victory to head the qualifiers by 0.71 secs. Yuriy Borzakovskiy went through with ease and looked ominously strong. Just two women went beyond the 60m qualification mark in the Javelin (Vira Rebryk, 61.84m and Goldie Sayers, 60.90m). Leading German throwers Christina Obergfoll and Linda Stahl both progressed. 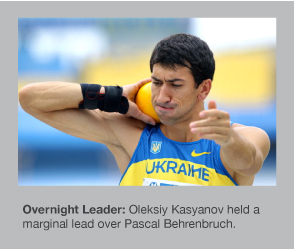 Oleksiy Kasyanov takes a 38pt lead into the fifth event (400m) over Pascal Behrenbruch (3446 vs 3408) after a strong start including 10.57 in the 100m and a 7.49m Long Jump best. The Women's 400m heats showed just how open this event is with nobody stamping their authority on proceedings. Ilona Usovich was the only athlete under 52 seconds with her 51.98 clocking and the top seven qualifiers were separated by just 0.6 secs. With the automatic qualifying height in the High Jump set at 2.28m, it was strange to see 10 of the 12 men progressing to the final with a best clearance of just 2.23m. Robbie Grabarz was among those going through to tomorrow's final. Just one thrower managed the automatic Javelin qualifying standard of 83m (Finland's Ari Mannio with 84.31m) and the home crowd had plenty to celebrate as Tero Pitkamaki made it two Finnish athletes in the final with his 80.66m. The Men's 3000m Steeplechase looks fairly open with a number of strong contenders including reigning champion Mahiedine Mekhissi-Benabbad, who won his heat with ease in 8:31.05. In the championships' first final, Mo Farah unsurprisngly took gold in the 5000m but needed a sub-54 final lap to storm away from his rivals. The winning time of 13:29.91 emphasises the slow, tactical nature of the race. Olesya Povh and Ivet Lalova won their 100m semi-finals in 11.23 and 11.13 respectively, although defending champion Verena Sailer looks a threat with her 11.17 run for second place behind Povh. In the Men's semis, Christophe Lemaitre and Jimmy Vicaut kept France in the medal hunt with victories, however the fastest time went to Norwegian Jaysuma Saidy Ndure after he clocked 10.13. After a close round of 400m heats, Oleksiy Kasyanov slightly extended his lead over Pascal Behrenbruch to 61pts with Roman Sebrle dropping down to sixth place. Less than 100pts separate third from ninth place. In one of the most remarkable performances in any event in recent years, American Ashton Eaton broke Roman Sebrle's 11-year-old Decathlon World Record at the US Olympic Trials in Eugene after accumulating a score of 9039pts. Eaton thereby also became only the second man in history to break the magical 9000pts barrier. It started so well for Eaton after he stormed to a 10.21 clocking over 100m for a new Decathlon best time before setting another new record in the Long Jump with a superb leap of 8.23m (also the 9th furthest in the world this year). The 24-year-old followed this incredible start with a 14.20m effort in the Shot Put and a solid 2.05m High Jump clearance. Day 1 was rounded off with 46.90 over 400m for a total of 4,728pts. The second day started with a 13.70 run in the 110m Hurdles against a -0.8m/s headwind then he managed Discus throw of 42.81m. Eaton then got over 5.30m to set a new Pole Vault PB and, for the first time, the World Record mark was in serious danger. With renewed focus, Eaton launched the Javelin out to 58.87m and backed this up with two other throws within one metre of this distance. Then it was all down to the 1500m. Taking over 4 seconds off his PB, he finished in a time of 4:14.48 and the record was his. The oldest existing World junior record was broken by 19-year-old Russian Sergey Morgunov as he leapt to an incredible 8.35m in Cheboksary on Wednesday 20 June. Competing at the Russian Junior Championships, he added 25cm to his previous personal best of 8.10m and elevated himself to joint world-leader (with Great Britain's Greg Rutherford). 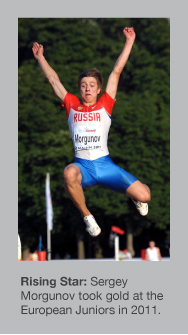 The forthcoming IAAF World Junior Championships in Barcelona are the next big target for Morgunov, who won the European junior title last summer with a wind-assisted jump of 8.18m (+3.6m/s). Randy Williams of the US had held the World junior record with a mark of 8.34m, which he set in the qualifying round of the 1972 Olympic Games in Munich almost 40 years ago. The 800m provided two of the standout performances of the Samsung Diamond League meeting in New York as David Rudisha and Fantu Magiso stormed to meeting records. Rudisha, whose previous best in 2012 was 1:43.10, ran a blisteringly quick 1:41.74 to get within just 0.73sec of his own World Record in the Icahn Stadium. In the Women's race, Magiso set another Ethiopian record as she won easily in 1:57.48 ahead of Molly Beckwith, who managed a season's best of 1:59.18. Tyson Gay made his return to competition with a 10.00 clocking over 100m to win the 'B' race as Yohan Blake took the honours in the 'National Race' thanks to a 9.90 run, holding off Keston Bledman (9.93) and Michael Rodgers, who also dipped under 10 seconds (9.99). In a loaded Women's 100m, Shelly-Ann Fraser-Pryce defeated her rivals with an impressive 10.92, although Tianna Madison should be delighted with her PB of 10.97 in second place. Francena McCorory almost dipped under the magical 50-second barrier in taking the 400m but had to be content with a lifetime best of 50.06. The Men's High Jump provided a fantastic tussle between Jesse Williams and this year's much-improved Robbie Grabarz. Both cleared 2.36m (representing a huge new PB for Grabarz), although the Brit had an earlier failure at 2.25m, which gave Williams the win on countback having enjoyed a completely clear card throughout the competition until he attempted 2.38m. An equally titanic head-to-head took place in the Javelin, where Barbora Spotakova threw a world-leading 68.72m in the first round, only for Sunette Viljoen to surpass it with her fifth attempt (69.35m). Spotakova almost did enough to regain the lead in the final round with a marginal improvement to 68.73m but the South African took a famous victory and set an area record in the process. Fabiana Murer only had one failure up to and including her world-leading clearance of 4.77m as she took maximum points in the Pole Vault. Elsewhere in the field, Olga Rypakova set a meeting record of 14.71m in the first round of the Triple Jump and Valerie Adams continued her incredible season by also setting a meeting record with 20.60m in the Shot Put. In a slightly below-par 110m Hurdles race, Jason Richardson prevailed with 13.18 and David Oliver was back in 4th place - his time of 13.37 was precisely half a second behind Liu Xiang's wind-assisted 12.87 performance from last weekend. The clock couldn't split Churandy Martina and Nickel Ashmeade in the meeting's final track race however Martina was given the verdict with both men running a swift 19.94. It was a Dutch national record for the winner. The Diamond League moves back to Europe for the 6th event in the series on Friday 6th July - just three weeks before the London 2012 Olympics get underway. Usain Bolt had to work for his 9.79 100m victory in the Samsung Diamond League meeting in Oslo this evening as fellow Jamaican Asafa Powell ran a season's best of 9.85 to impress the capacity crowd and remind the world that he could still provide an upset in London at the 2012 Olympics. 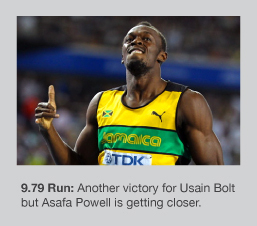 It was an improved showing for Powell, who had been comprehensively beaten by Bolt a week ago in Rome. Norwegian Javelin legend Andreas Thorklidsen could only manage 3rd place with a best of 82.30m as Vitezslav Vesely threw a world-leading 88.11m for a resounding win by a margin of over 4m. 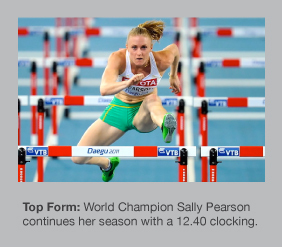 It was yet another comprehensive hurdling performance from World Champion Sally Pearson as she equalled her own world best time of 12.49 ahead of Kristi Castlin, who smashed her PB running 12.56 for second place. There was a superb African record in the Women's 3000m Steeplechase as Milcah Chemos ran 9:07.14 to elevate herself to 4th on the all-time lists. Sofia Assefa set an Ethiopian record of 9:09.00 behind Chemos. A fantastic performance by Eilish McColgan culminated in her going under the Olympic 'A' qualifying standard with a personal best time of 9:38.45. Murielle Ahoure sprinted to 200m glory in a new Ivory Coast national record of 22.42, while Abi Oyepitan signalled her return to form following a long period out with injury by clocking 22.71 to take the runners-up spot. It was business as usual for the tall Puerto Rican Javier Culson, who cruised to a world-leading mark of 47.92. Reigning World Champion Dai Greene found it tough back and finished 4th in 48.98 - a long way off his best although he is returning after a virus, which caused him to miss the meeting in Rome last week. In other events, Chaunte Lowe cleared 1.97m to take victory in the High Jump, the prestigious Dream Mile unsurprisingly went to Asbel Kiprop in a time of 3:49.40 and Olympic champion Tomasz Majewski was too strong for the Shot Put field, winning with a best effort of 21.36m. New York hosts the next round of the Diamond League series on Saturday, where many of the top US athletes will be testing themselves ahead of their all-important national trials for the London Olympics.